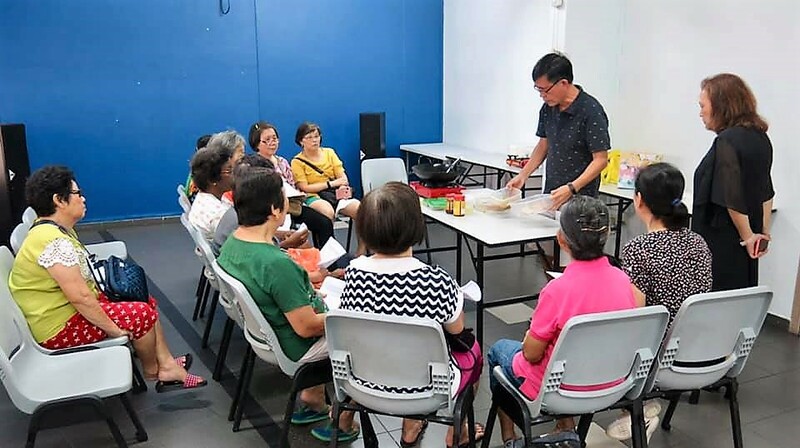 this my 5th cooking demo and sharing. fried rice i could do on the spot. 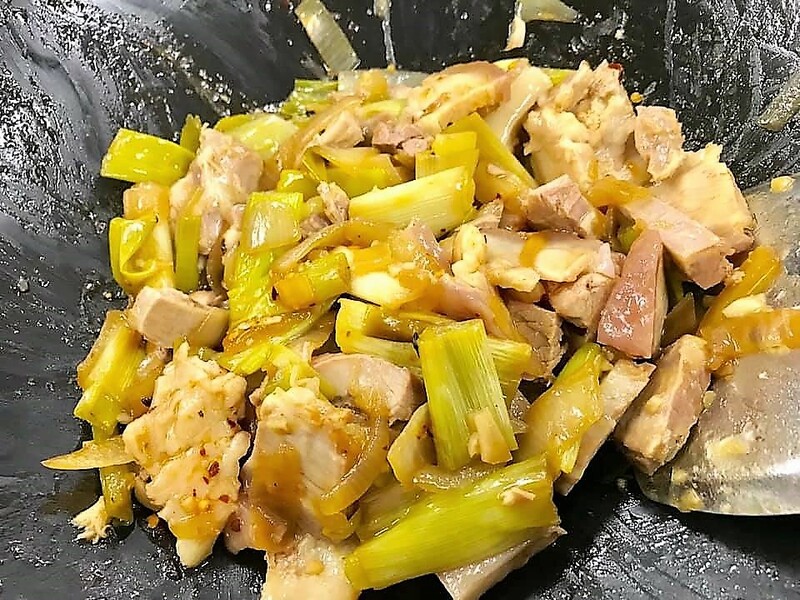 回锅肉 doublecooked pork i cooked the belly pork first and also the leeks and onions first as leek took some time to cook. then i fried with leeks and onions on the spot. 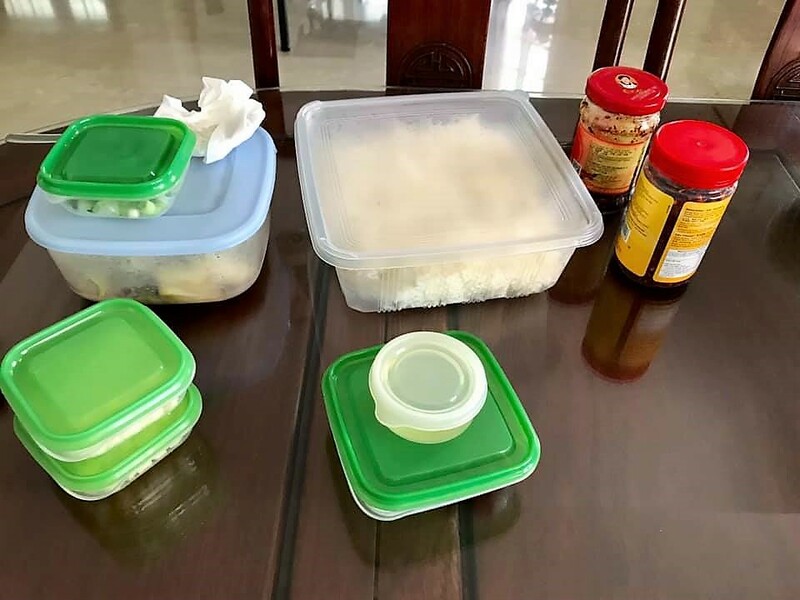 so there were many ingredients/boxes i have to bring – like cooked rice, minced pork, salted fish, egg white, chopped garlic, oil chopped scallions and crispy chilli for garnishing the fried rice, mala chilli for frying the 回锅肉 doublecooked pork etc. 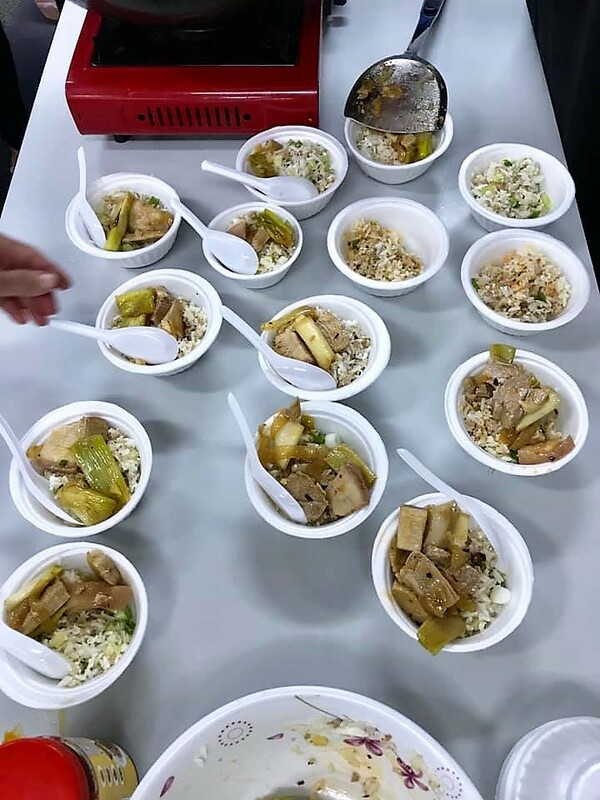 i started with fried rice dish as it took a while to cook on the spot.回锅肉 doublecooked pork is easy & quick just mixing the 2 items – belly pork and vegetables together. this a very interactive class. 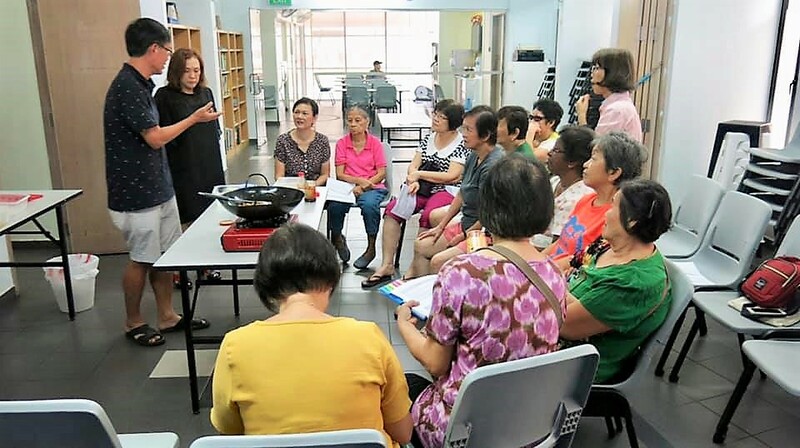 they have many questions throughout the session = like can use salted egg or olive vegetable instead of salted fish, why egg white, what’s the difference using whole egg etc..
i started by explaining that i fried the chopped garlic and salted fish together as i didn’t want to burn either and i happened to have broccoli stems which i cut into small pieces to give texture to the fried rice. 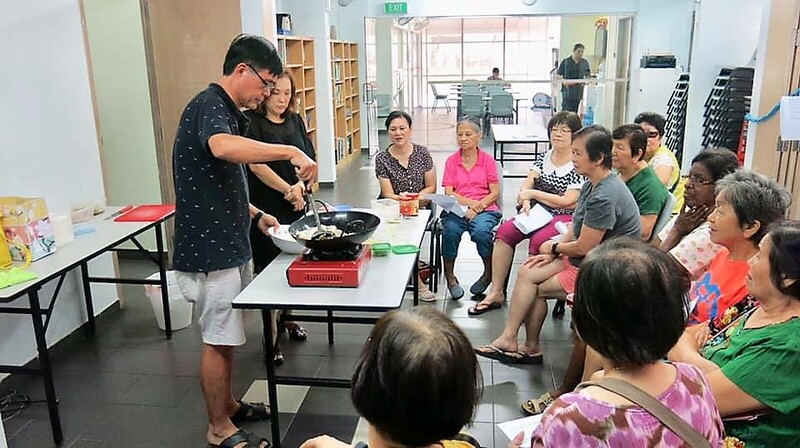 salted fish gives a very fragrant flavour when you fry. i turned the fire to high and added the cooked rice and fried, mixed thoroughly, high heat, not too long, then dished out and set aside. 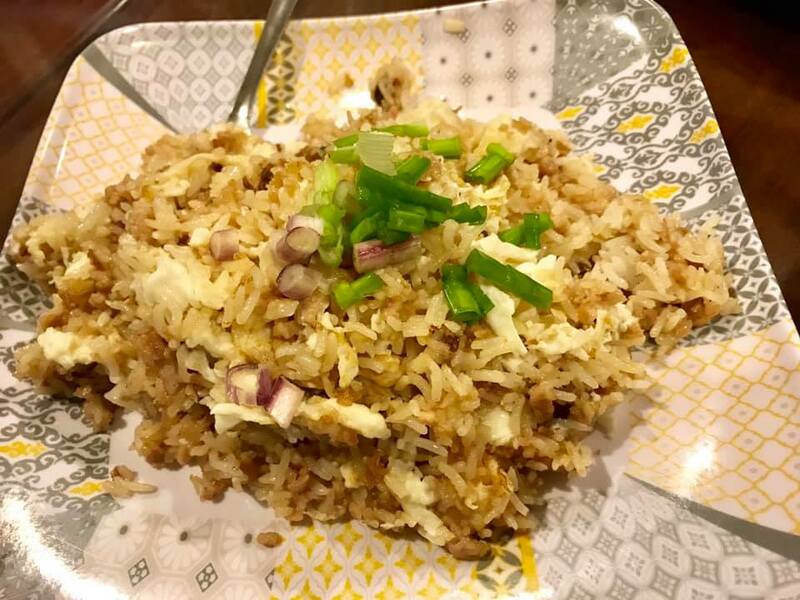 the fried rice is tasty as it is. 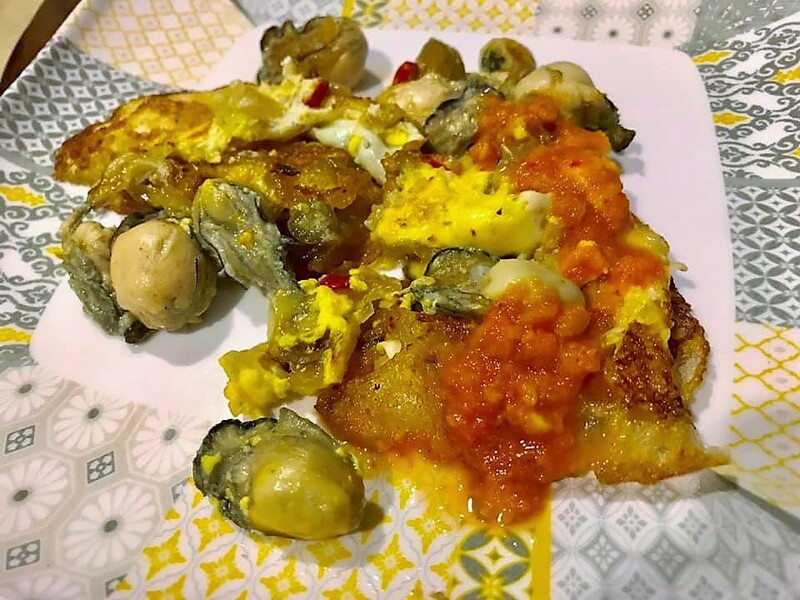 i explained that the proportion balance of ingredients is important so by agaklogy i did not add all the rice (2cups) so as not to diu=lute the taste. now i fried the egg white – i had 5 egg whites, so maybe equal to 2.5 eggs. it is important to let the egg white formed, so that it would not be messy. this step is most important whether using whole egg or egg white. 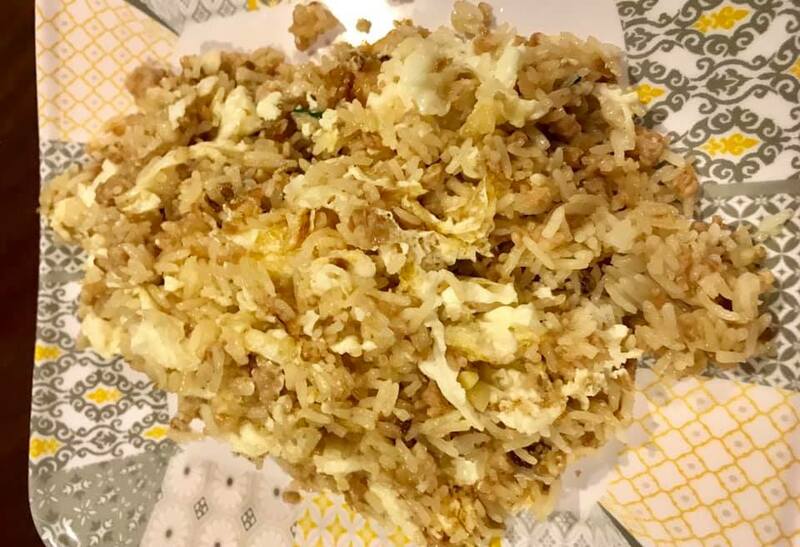 now i added the fried rice and folded the egg over and broke it up so like in the restaurants you see the distinct bits of egg whites. 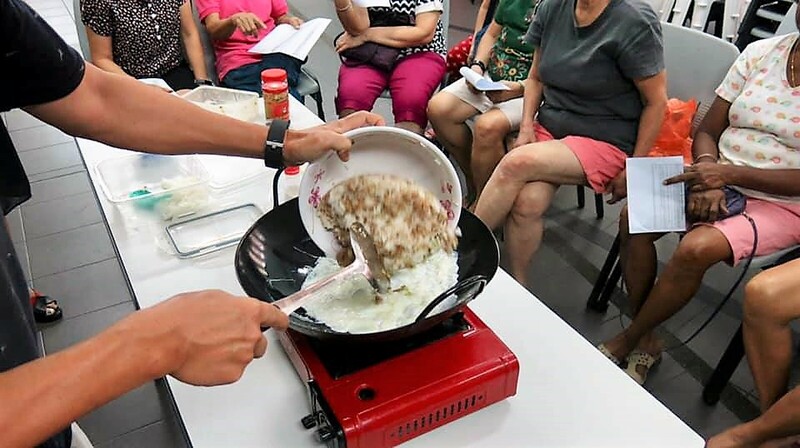 if the whole egg or egg white is added to the rice and fried, then it coats the rice and the texture is more sticky and mushy, whereas this way the rice are individual grains. 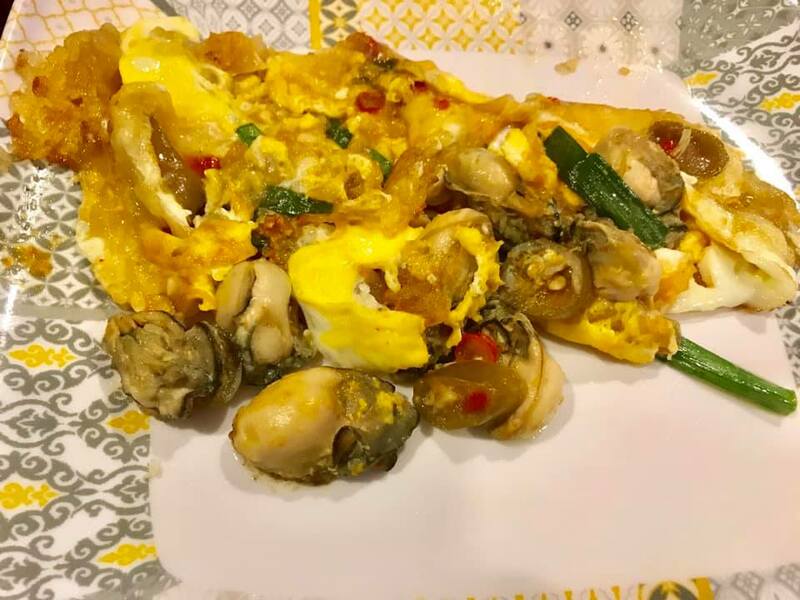 egg white or whole for me is just aesthetics..of course the taste also a bit different and a golden colour fried rice is also appetising as well. i like both preparations. 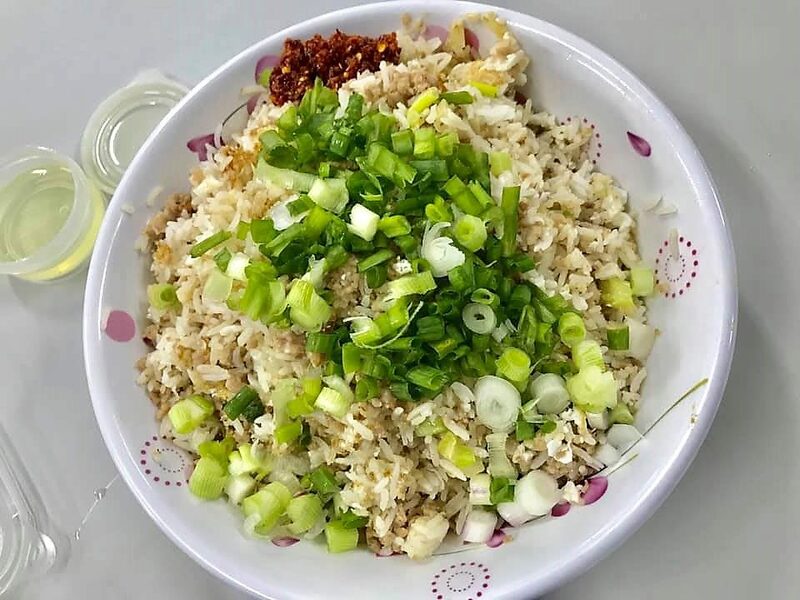 the fried rice is best presented on a large plate garnished with chopped scallions. i added crispy chilli. they all like the crispy prawn chilli and several added extra to their bowls. 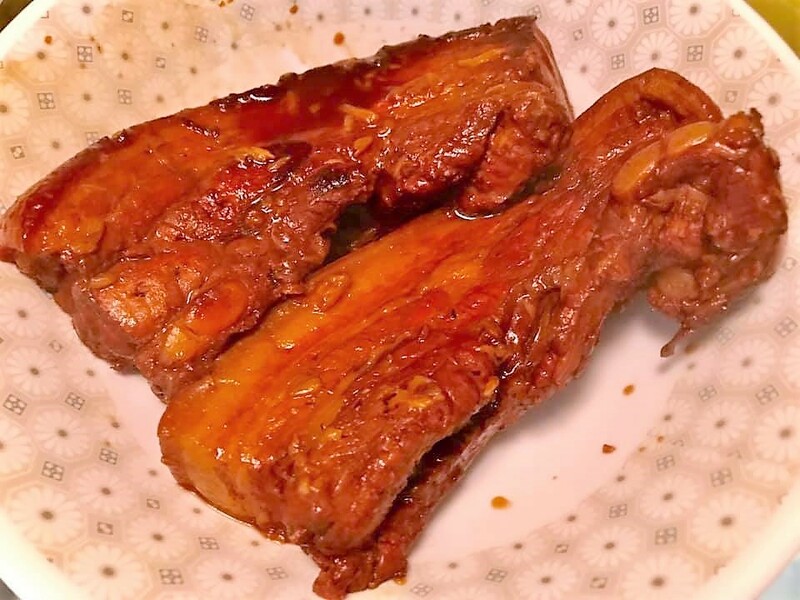 the 回锅肉 doublecooked pork is quite straight forward. i explained that 回锅肉 is a sichuan dish 四川菜肴 and generally done with mala chilli and fried with various vegetables. 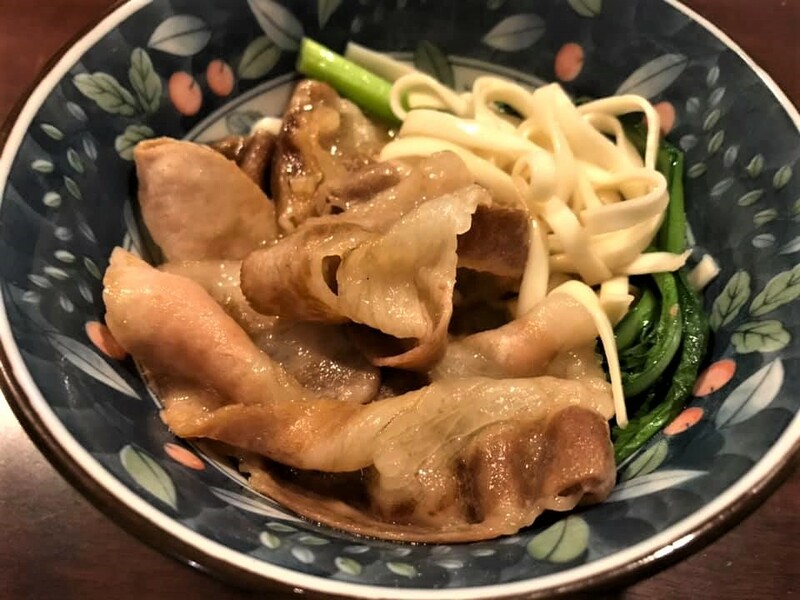 the english translation is doublecooked pork (double cook as in returning the pork to the wok to cook a second time so the name 回锅肉). 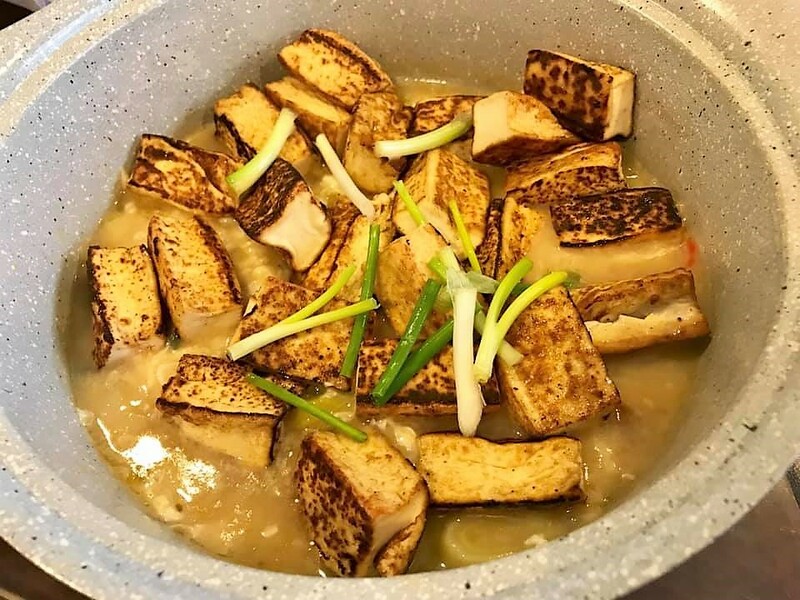 doublecook though is a common technique used in every cuisine western or asian…teochew has 半煎煮鱼1/2 fried and braised fish and western dishes even steak has reverse sear method sous vide then pangrilled or flamed etc. today i have leftover leeks so i fried leeks (the white part) and yellow onions with a bit of oyster sauce. covered wok to cook for 5 mins and make sure leek was just done and not overcooked. the simple veg dish alone smelled great actually. 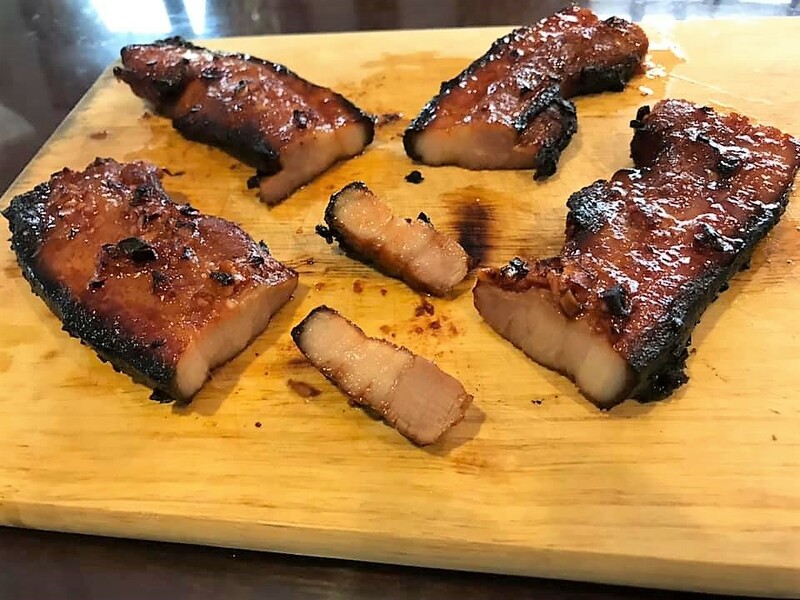 the belly pork i salted for few hours then boiled in water for 1hr 40mins, most important test poking a chopstick through the lean meat going through cleanly. cooled it and put in fridge. this so that i could cut the belly pork cleanly w/o fraying when adding to the veg. 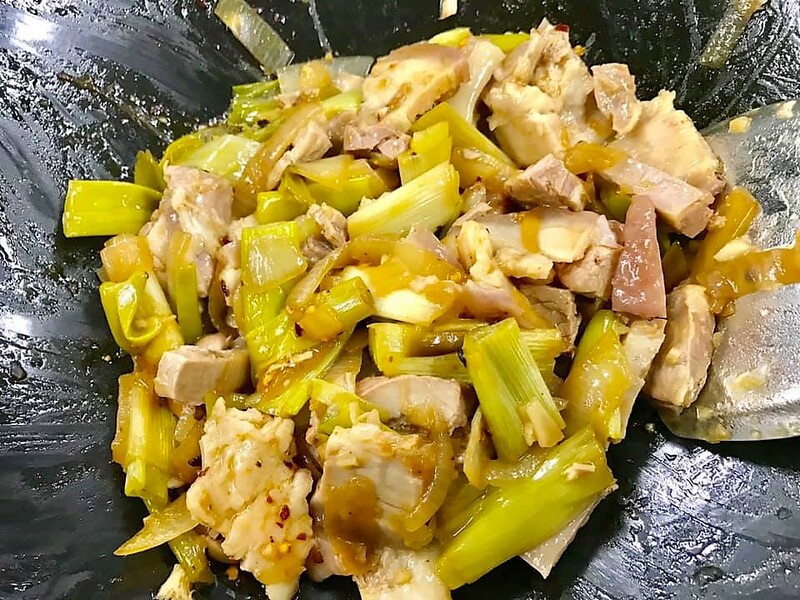 so now just put the leek and onion to the wok on high heat, added the cut belly pork, then added 1 tbsp of mala chilli oil…(because request to add less, i added 1tsp…later everyone said it was very fragrant not enough though so some added more themselves). it was a very meaningful day for me and i hope for the participants as well. 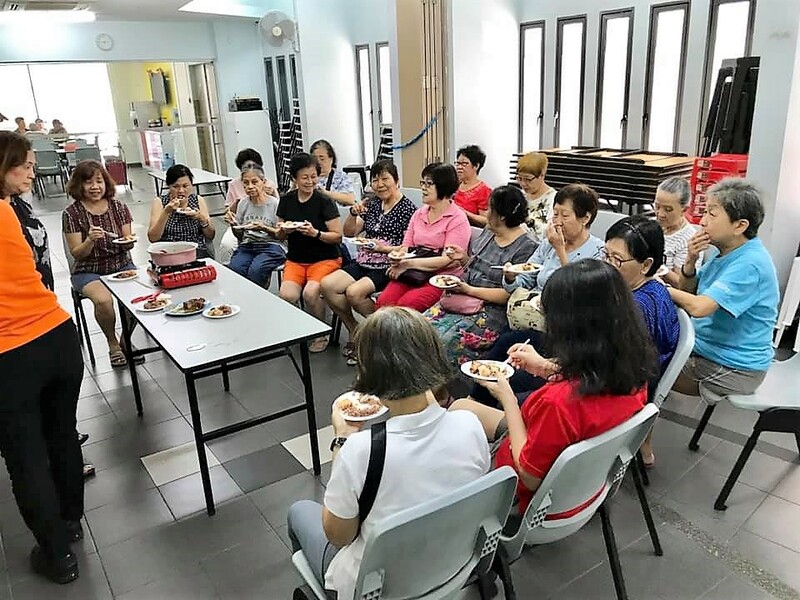 everyone was enjoying the food and they were full of questions and very participatory so i guess it was time well spent for them as well. 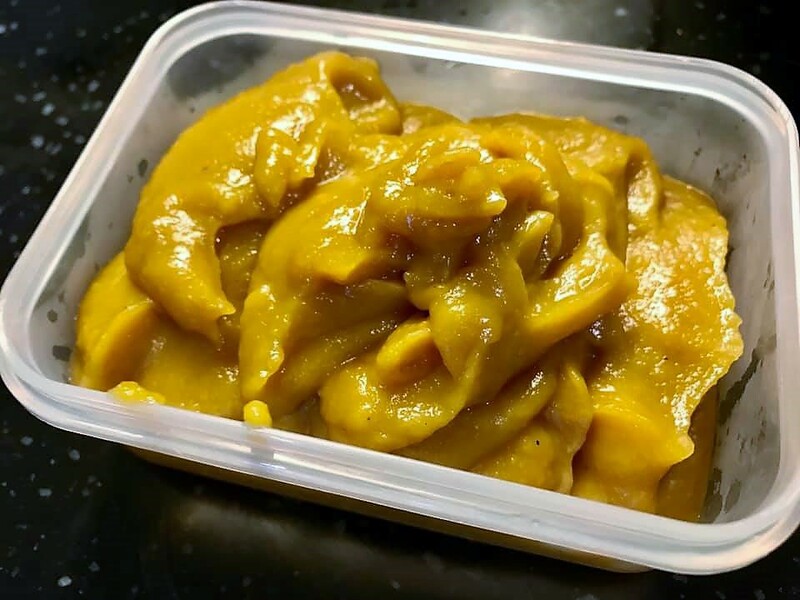 just last month we had great salted egg pork chop at hk street old chun kee at commonwealth crescent recently on 9.7.2018.
so i decided to replicate this evening, my very first salted egg pork chop 排骨王. and it turned out it was very good. both CM & KK both commented. 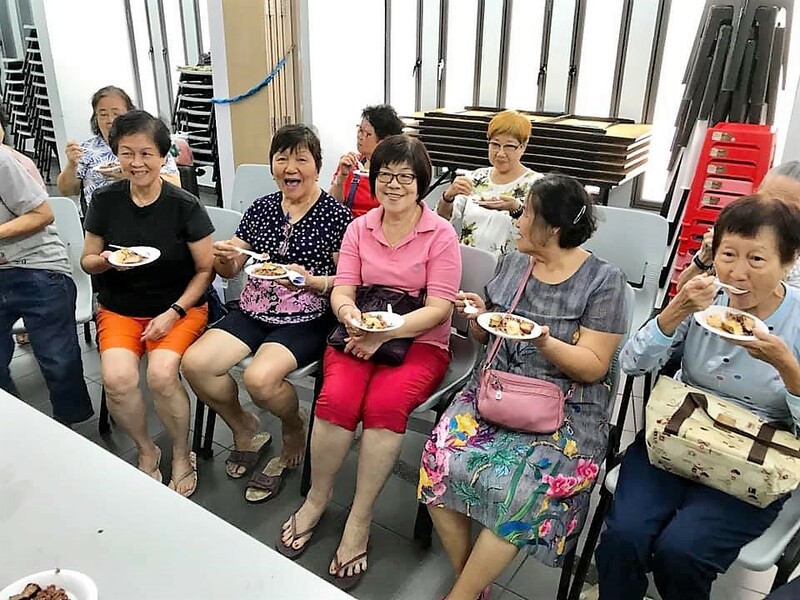 i used frozen pork chops from sheng shiong, sliced the 5 pieces in 1/2 to make 10 thin pieces, marinated with fish sauce, white pepper & 1tbsp corn flour. 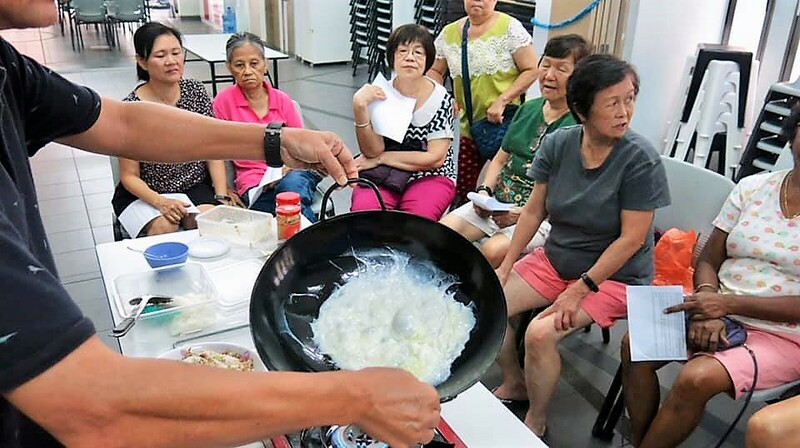 it was that simple, just fried the salted egg paste with little oil and 2 twigs of curry leaves, then added back the pork and mixed thoroughly. 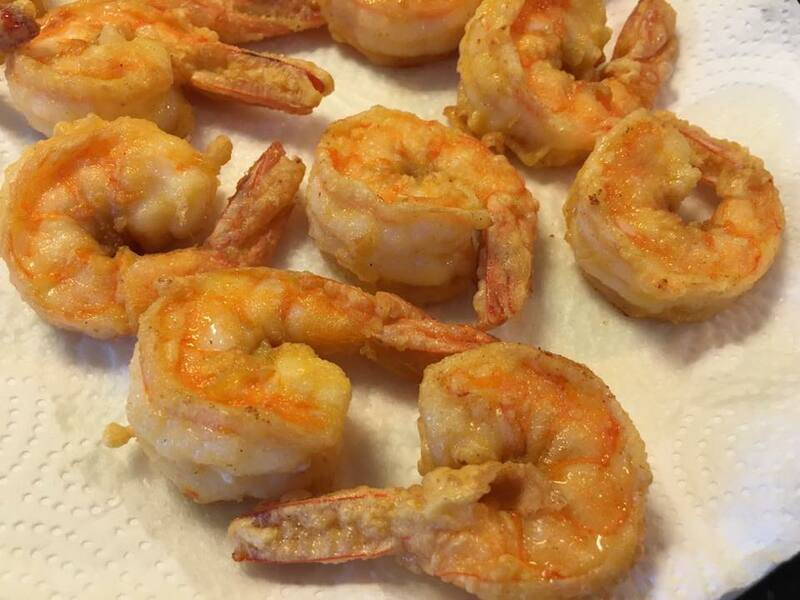 prawns were done the same, coated with egg yoke and cornflour and shallow-fried for 1 min to golden. 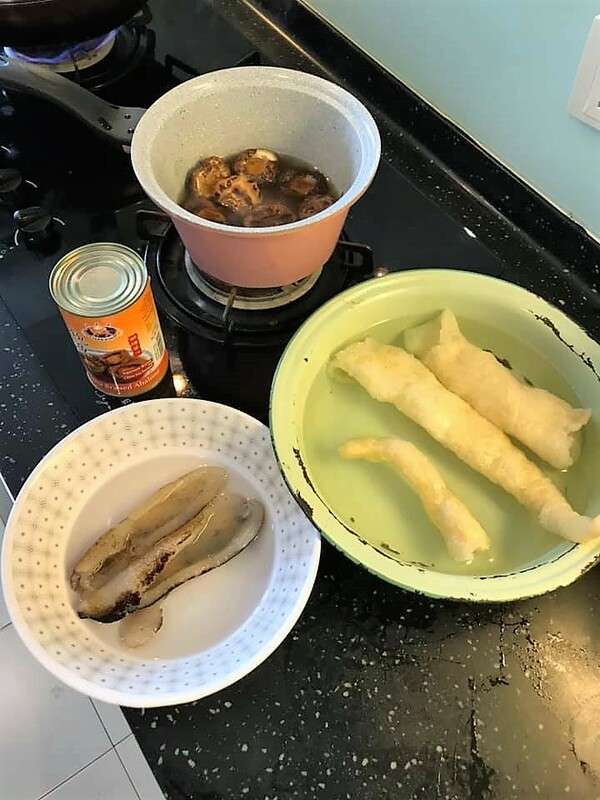 it was fun for me making the prawns, as i generally hate to do deep-frying – a lot of wastage of oil & additional cooking steps, i just do this shallowfried like <2cm of oil sufficient, in a small diameter pot. do in batches, do not crowd the pot. i did like 6 at a time, just couple mins to cook prawns. 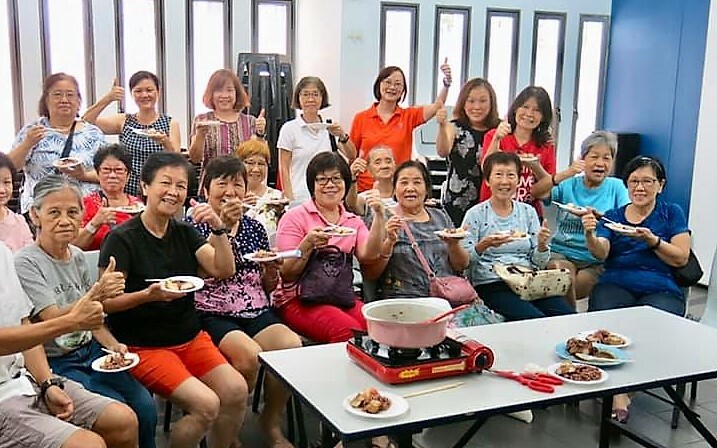 the last time (for a 27pax family CNY day2 lunch on 6.2.2019), i used a ready made sauce. it (the sauce) was not that good even though the prawns were done well. 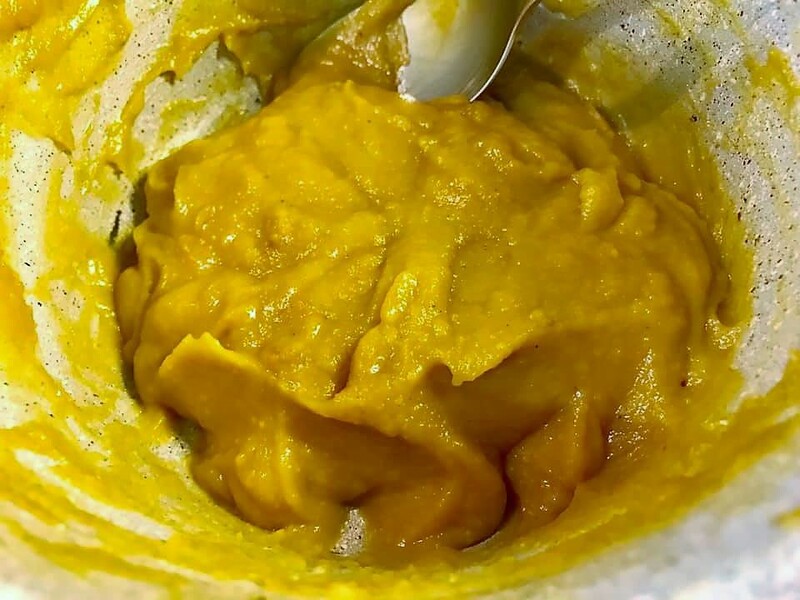 so this time i decided to make my own sauce. 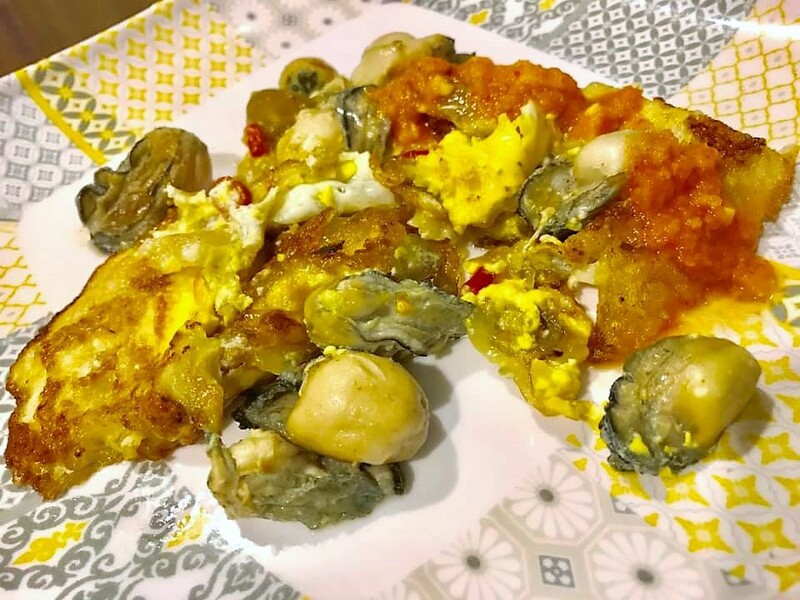 this evening i served 15 prawns, so i decided 3 salted egg yokes would be enough, and it was. 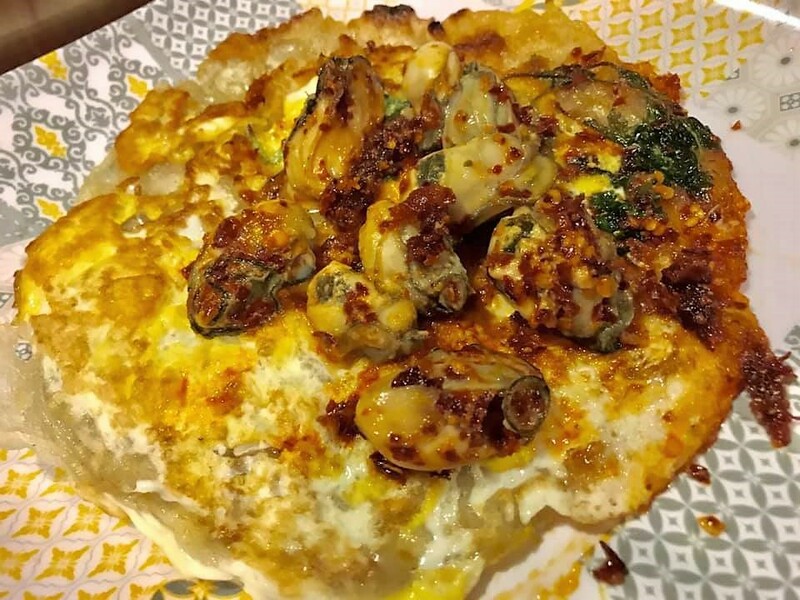 so fried the salted egg yokes with 3 twigs of curry leaves and 1 cut chilli padi. 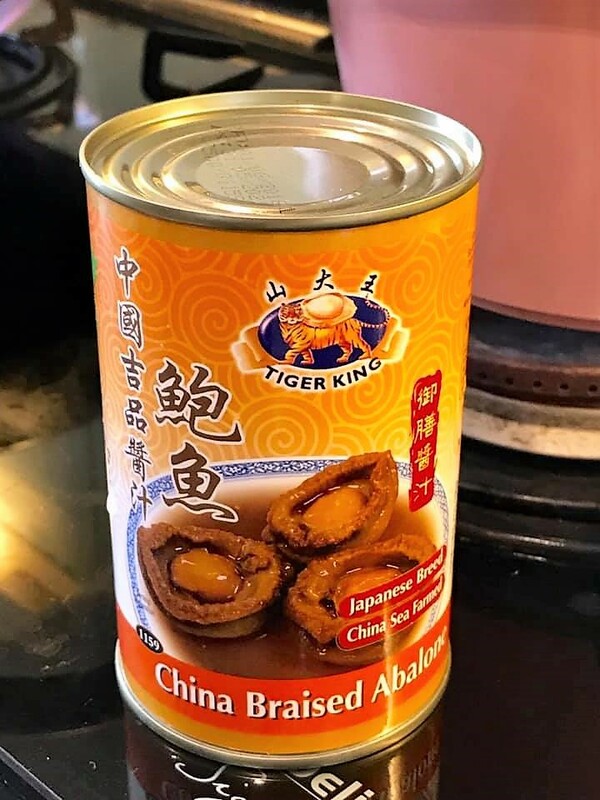 for the 27pax family CNY day2 lunch on 6.2.2019), i used a packet salted egg sauce bought at tiong bahru market stall. 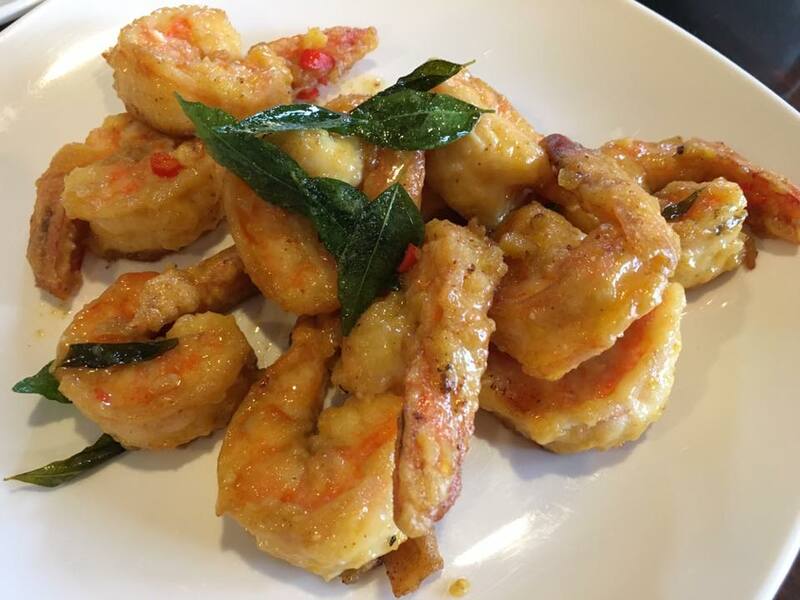 prawns were good but the the packet sauce didn’t give good enough flavours and texture. i did at an earlier version (using for the first time a sauce given to me by WM & J). 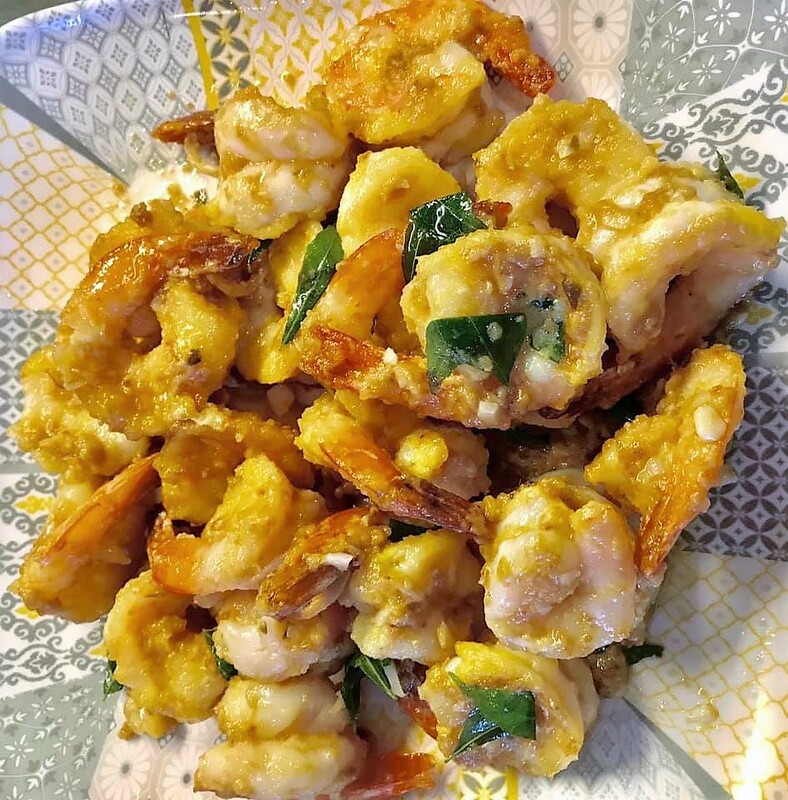 this time, i shortcut the process by mixing the prawns in a mixing bowl with fish sauce, white pepper, 1 tbsp corn flour, 1 tbsp plain flour, 1 egg yolk & just mix. 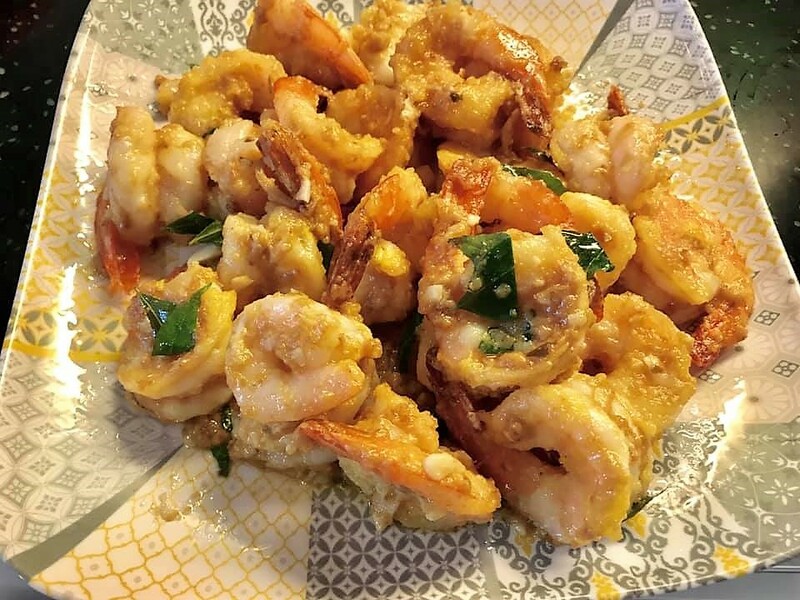 this way cut out the inconvenience & messiness of dipping the prawns in cornflour, flour & egg yolk before frying. 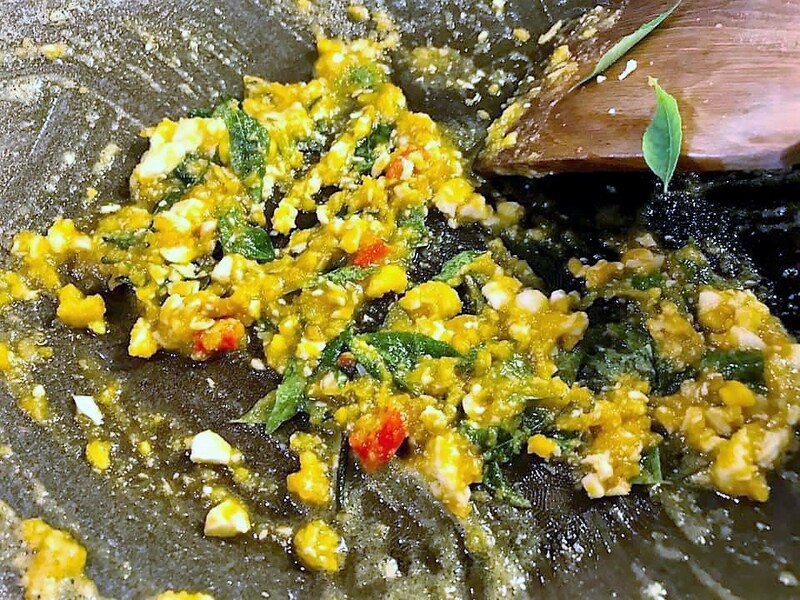 and then it’s just to fry cut chilli padi + curry leaves in the salted egg mayo sauce mix, then add the prawns to coat. 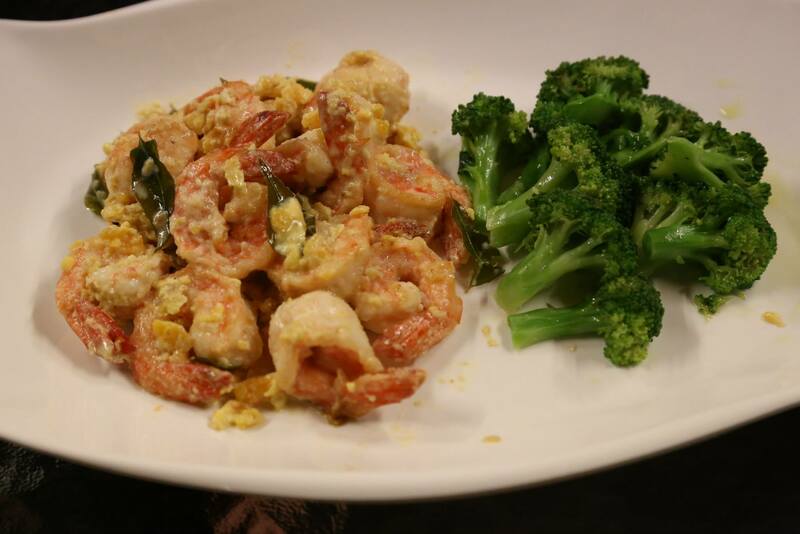 was quite excited doing salted egg prawns, my first attempt at this dish in 2014. photo looked ok but that was to me, considered a failure. 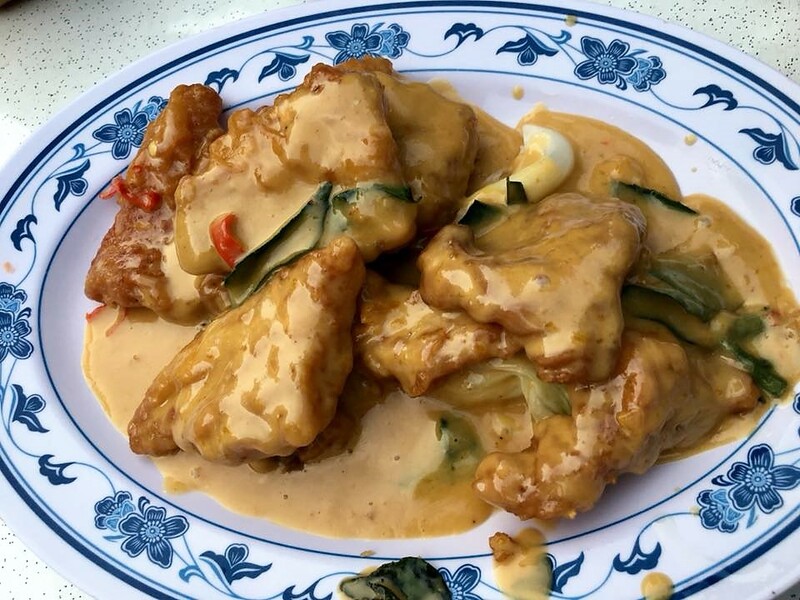 i prefer to make the sauce myself (4 salted egg yokes sufficient for 20 large prawns). 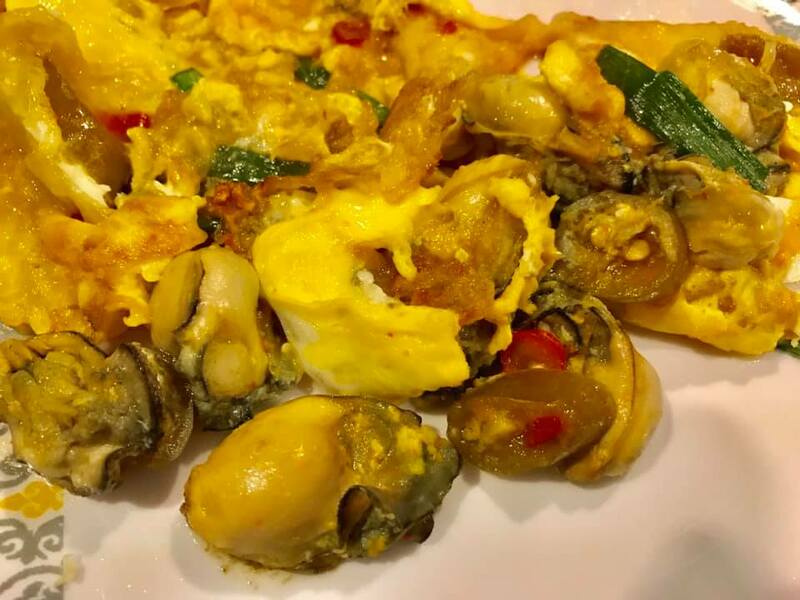 can coat with cornflour, egg yoke when preparing or just mix all together. 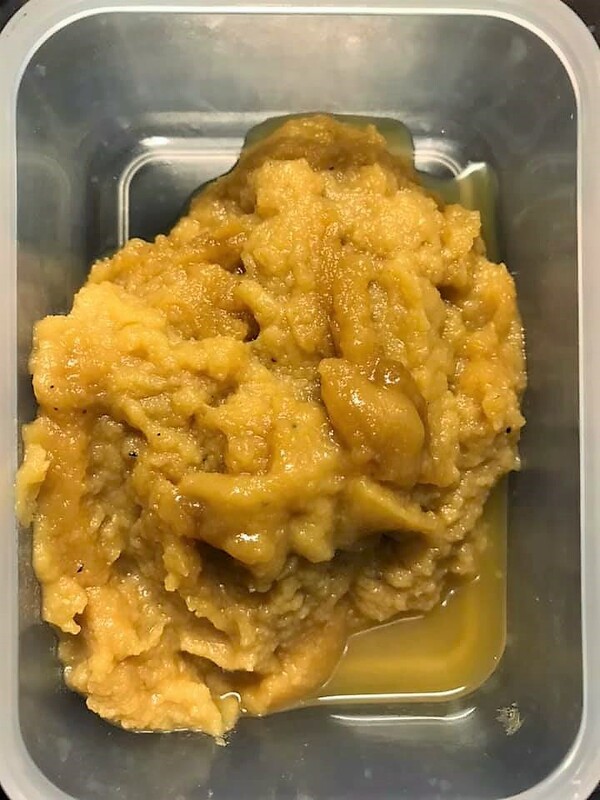 i use 2 pig trotters & a SKINLESS chicken leg (thigh plus drumstick) and belly pork to provide a very sweet, tasty, gelatinous soup base. 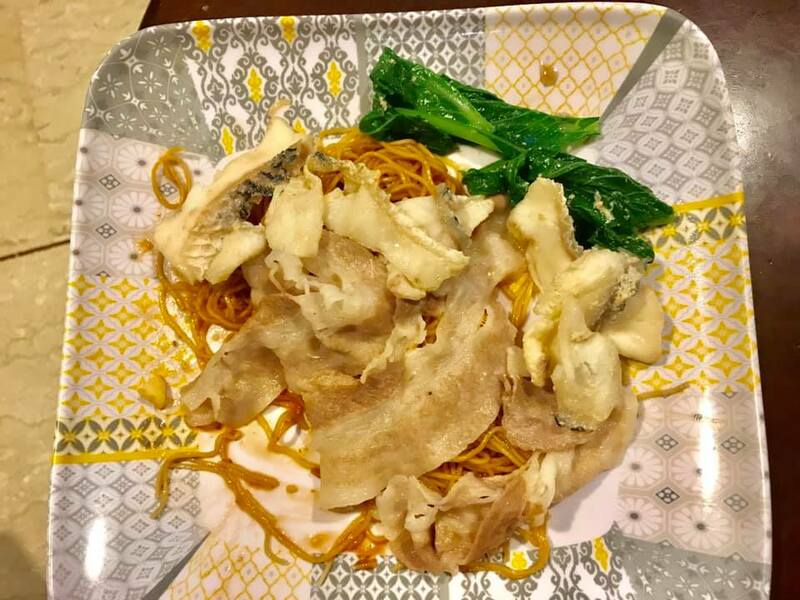 then added fish maw, sea cucumber, pig tendons, chicken breast and each at the right timing to deliver great texture. i use cold slow cooker on low heat method, about 6hrs. i just based on estimation “agaklogy”, but can also use a meat thermometer set at 90degC on the belly pork. remove belly pork, and 1/2 the trotters (that i wanted to preserve the excellent texture and not just used for stock base). 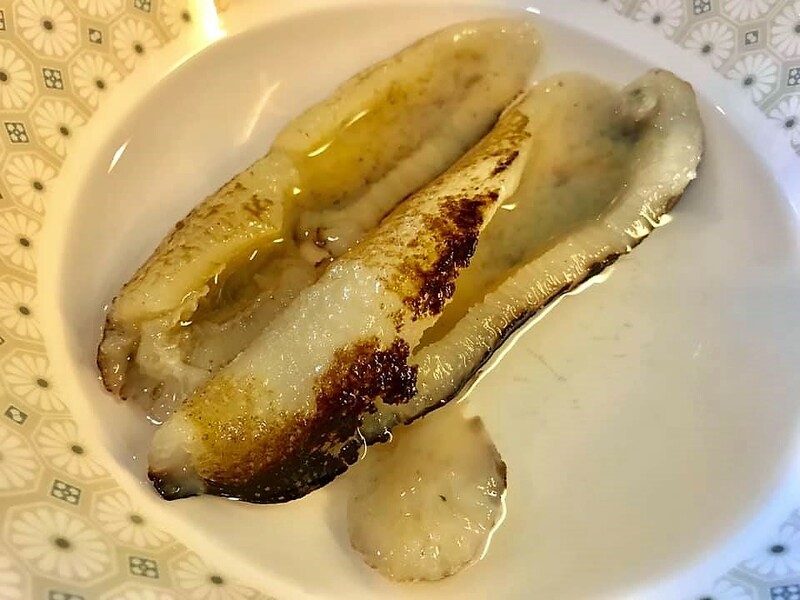 added fish maw and turned to high, about 2hrs, pig tendon 1hr and sea cucumber about 1/2hr to 1hr depends on quality of sea cucumber and thickness. then off the cooker and poached the skinless chicken breast. 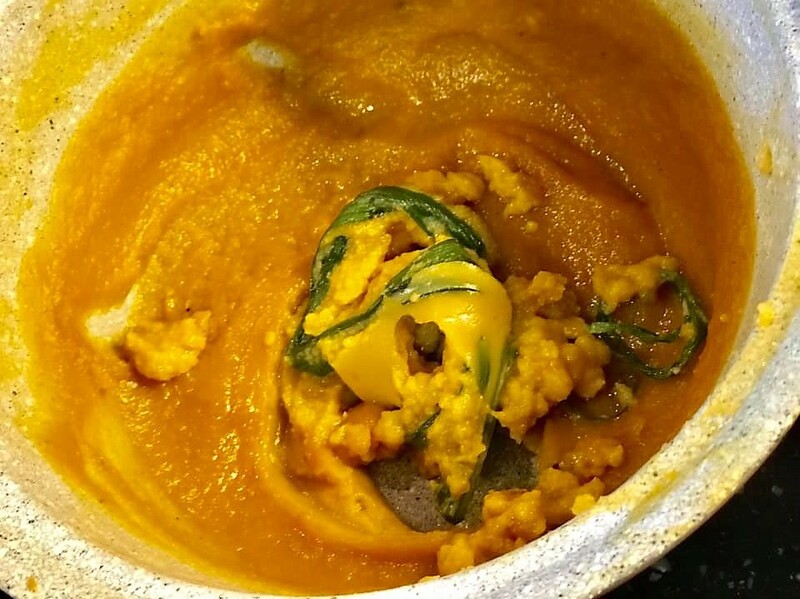 when serving prepare the bowls with the ingredients, boil the soup and add to the bowls. i microwave the bowls of ingredients for 1 min so that it is warm. then added the soup. 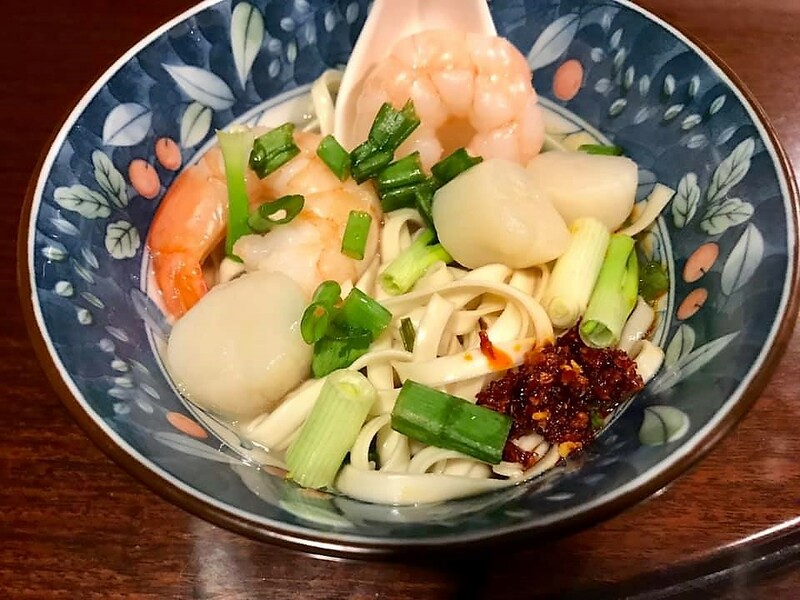 today was the second time i prepared this soup so everything went smoothly, and quite perfect. the ingredients texture all good including the chicken breast and the soup was just incredible, so smooth, so tasty, so flavourful. 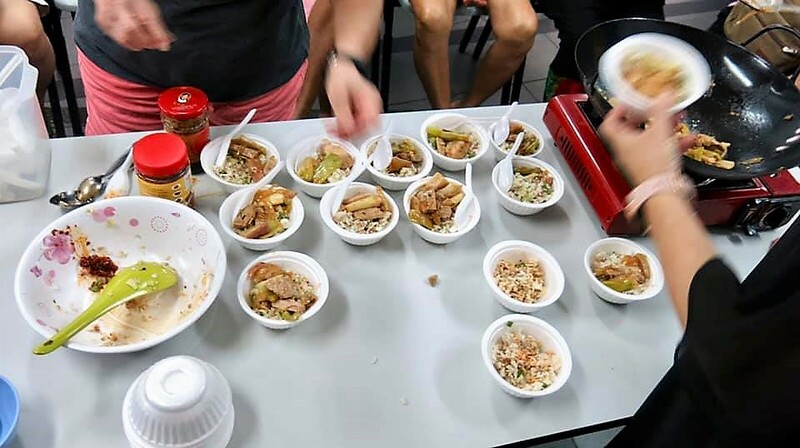 the first time i did this jump over the wall thingy was for a 10pax RI bros post CNY dinner on 21.2.2019.
that day since i was already having pencai 盆菜, so i used cheaper ingredients like pig trotters and belly instead and called it “piggy jump over the wall”. lol! turned out that this (the soup) was the best dish. i think at least one bro had 3 bowls of soup. 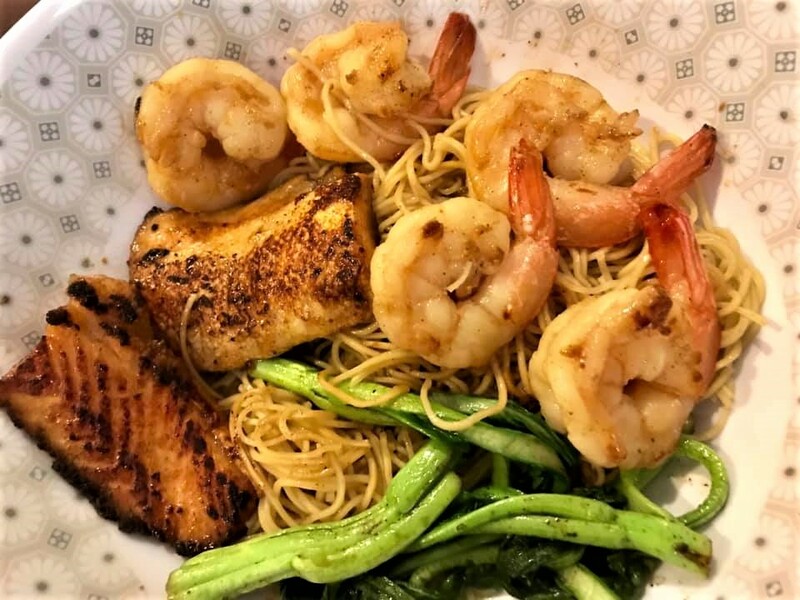 there are many ingredients so it seem complicated to make, but actually like any other dishes it came to managing/delivering taste and texture. 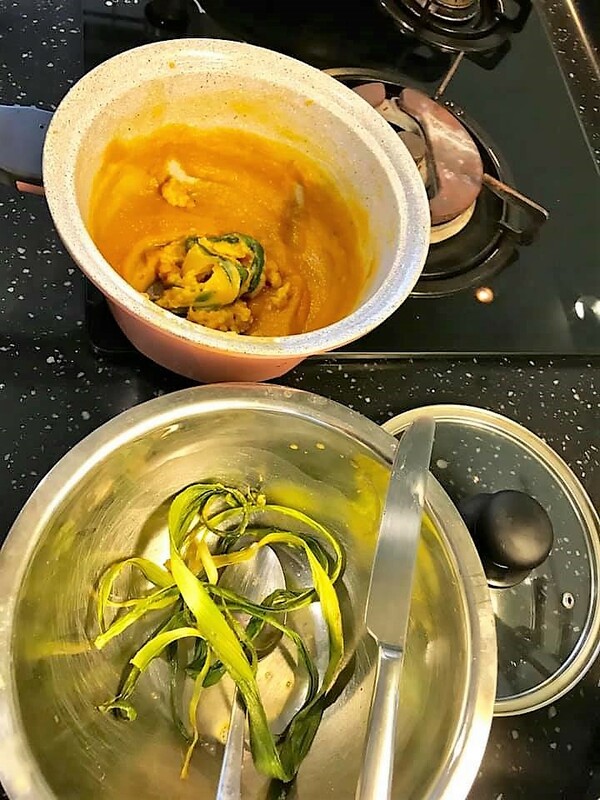 so the soup base was important, and once we have a tasty soup, it is to ensure the correct texture of the ingredients, so each has toe be managed at the correct timing. 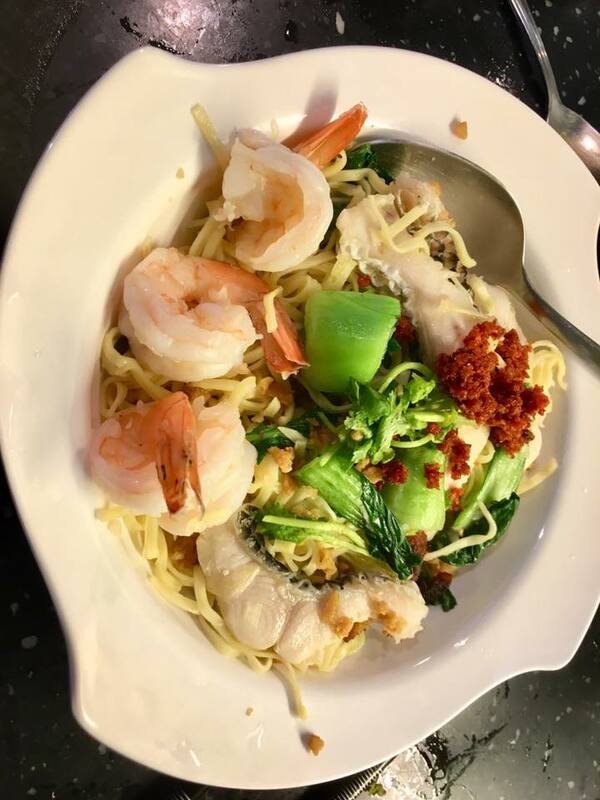 as i said before a truly delightful dish, a wonderful feeling of satisfaction. 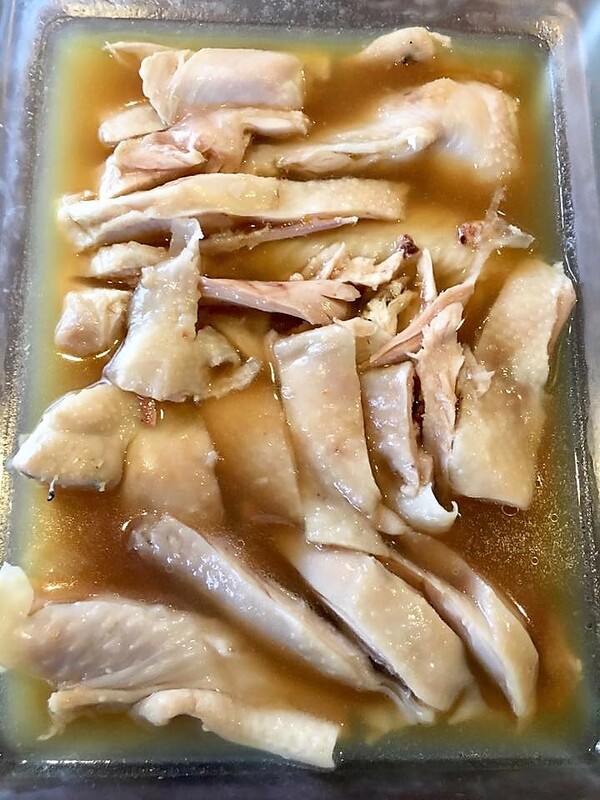 poach & clean trotters and belly pork, clean them and skinless chicken leg, place in cold slow cooker filled with water (about 1.5l to 2l) turn to low, add 1tsp flat salt, about 6hrs. (can also use a meat thermometer set at 90degC on the belly pork). remove belly pork, and 1/2 the trotters (the portion i want to preserve the excellent texture and not just used for stock base). 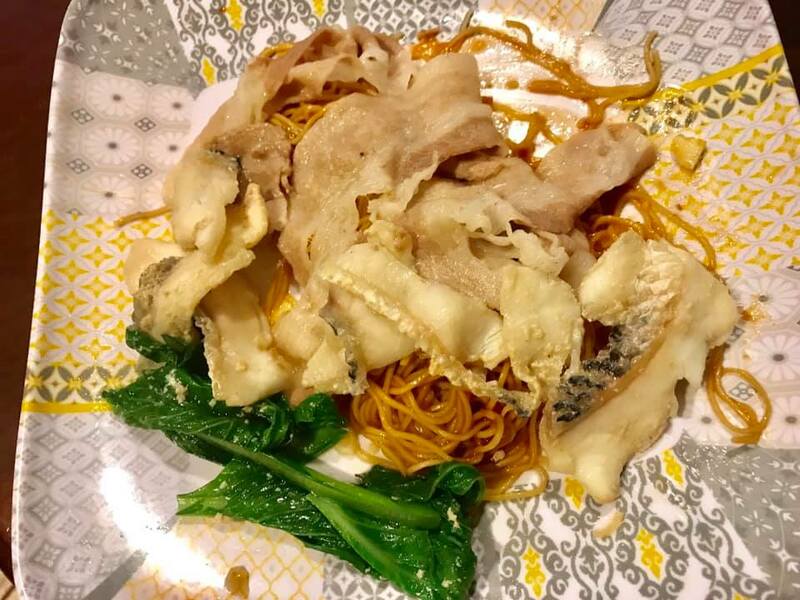 add fish maw and turned to high, about 2hrs, pig tendon 1hr and sea cucumber about 1/2hr to 1hr depends on quality of sea cucumber and thickness. then off the cooker and poached the skinless chicken breast. 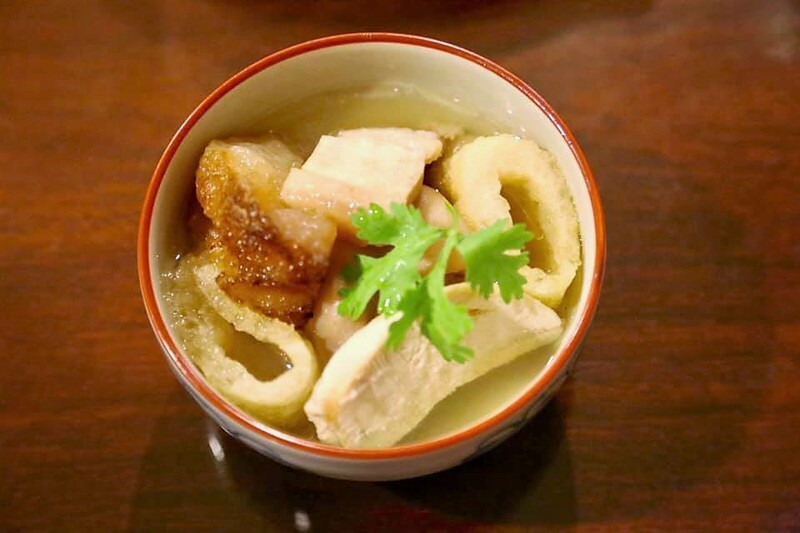 when serving prepare the bowls with the ingredients, boil the soup and add to the bowls. (i microwave the bowls of ingredients for 1 min so that it is warm. then added the soup). perfect texture & taste 👍. nothing less! 4 place on rack drizzle 1tsp honey and place in 250degC oven for 16mins. leave char siew in oven for 4 more mins. 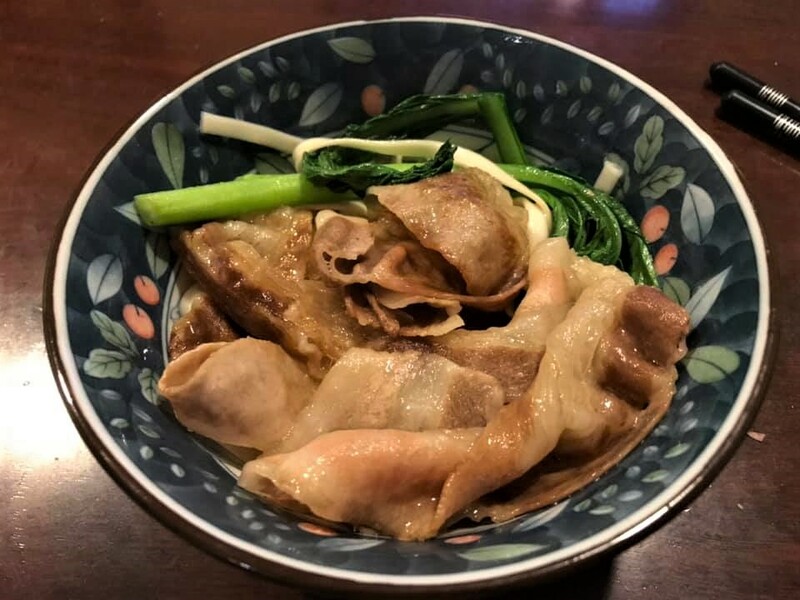 made a light 1pax dinner this evening on 20.2.2019..
used my last bunch of 豆签misoya. so went sheng shiong to get some more. 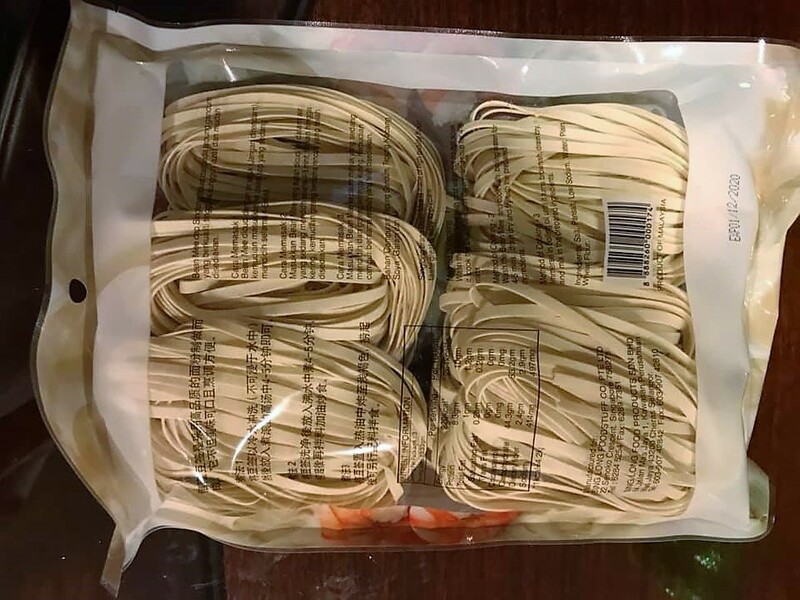 i bought the cheaper sinlong brand = $1.25 250g 6 bunch/pieces..
i had stock but even if no stock just add tsuyu which is the japanese soba stock. add little water plus tsuyu (OR just use stock). 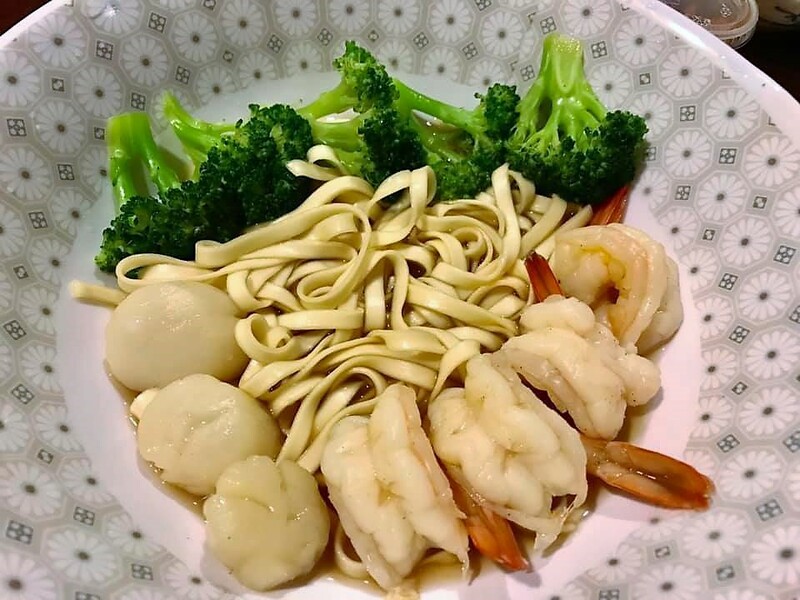 add prawn first, then scallops and noodles soup 豆签. 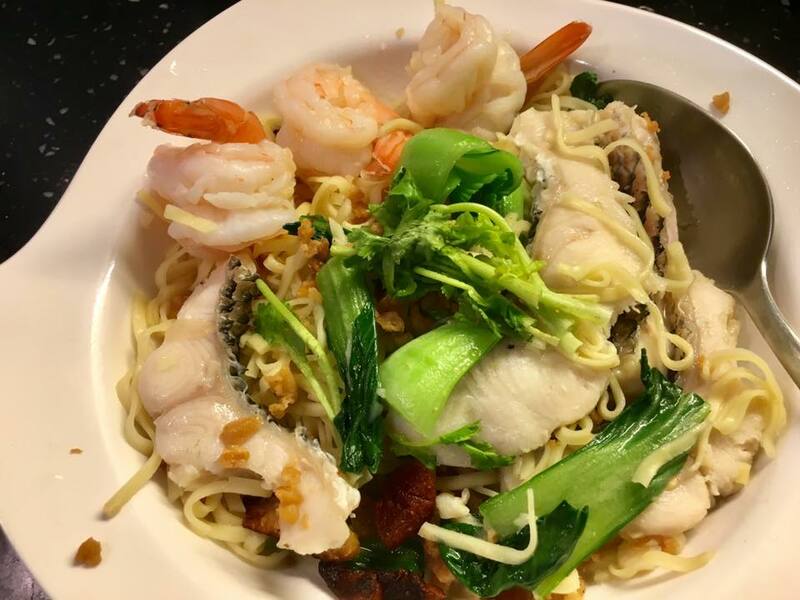 this like instant noodles, probably took less time to cook then instant noodles, lol! an immensely satisfying, totally shiok! 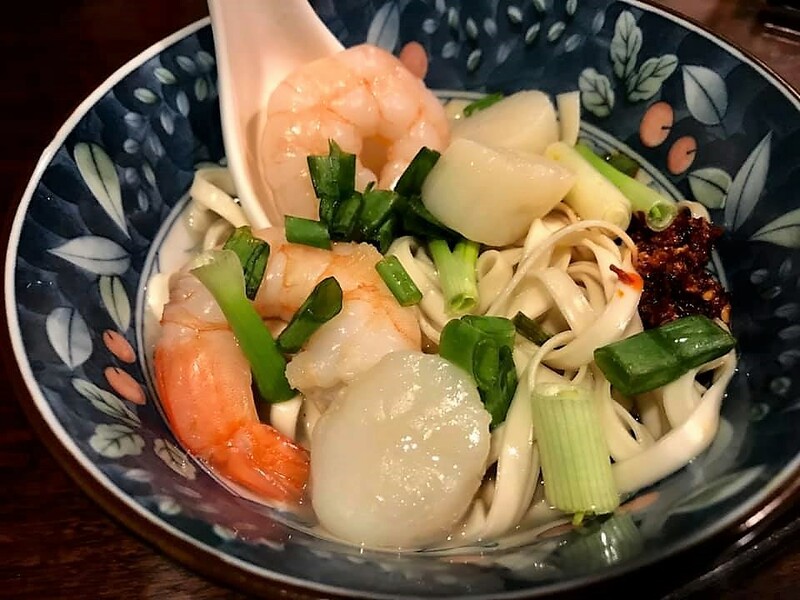 bowl of wonderful goodnes. 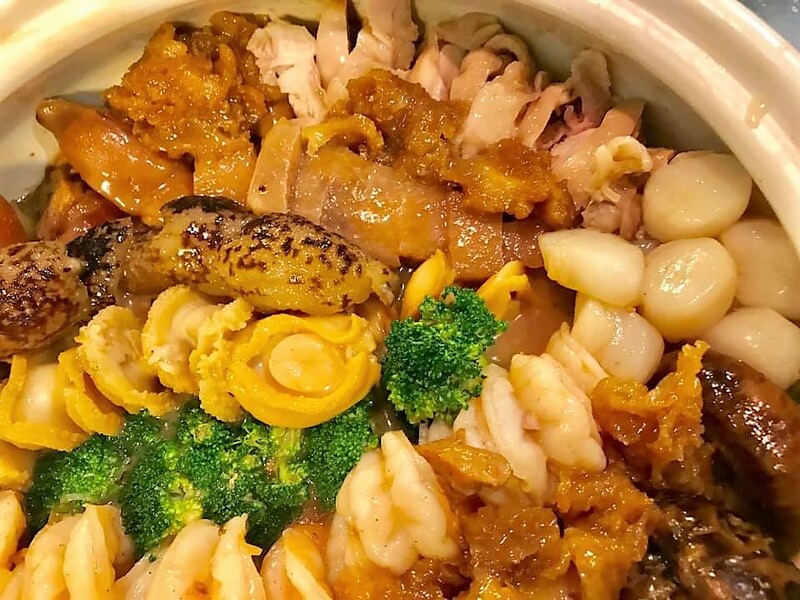 and the noodles soup 豆签 very light, prefect for me low carb diet. it’s chinese new year eve! i made pencai for this evening’s reunion dinner at my brother’s house. this the first time i made pencai 盆菜 after giving the dish planning some serious thinking..
盆菜was delicious! 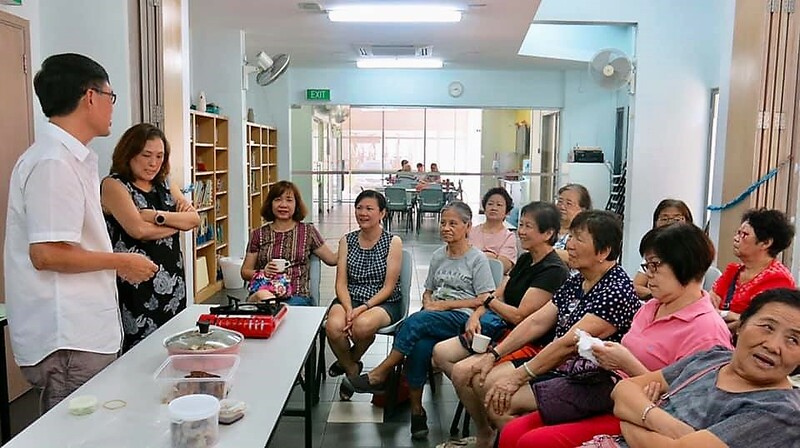 everyone loved…sil said better than what they had few days back bought from hotel restaurant…as matter of fact, i was using a tunglok claypot which i bought like S$248 6pax pencai 盆菜 from tunglok maybe 6years back also for CNY reunion dinner. that was a real disappointment! 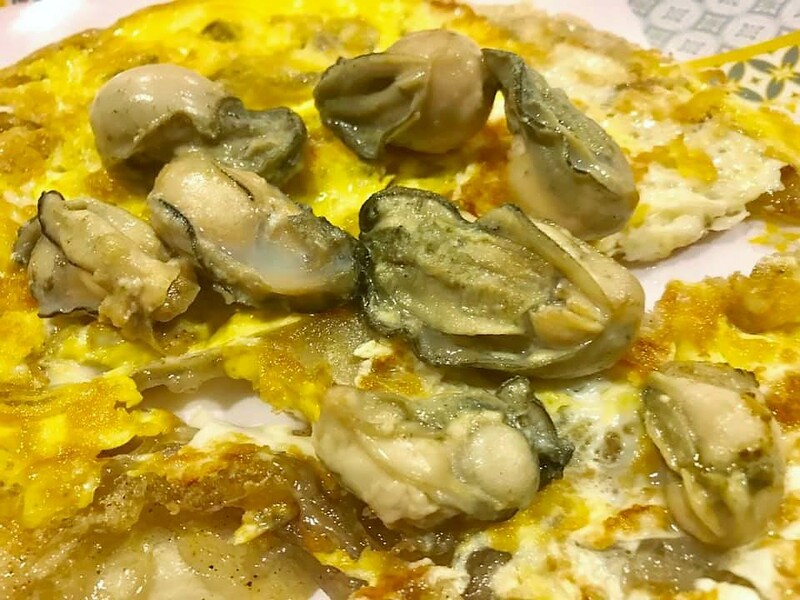 i think my pencai 盆菜 was just so much better! 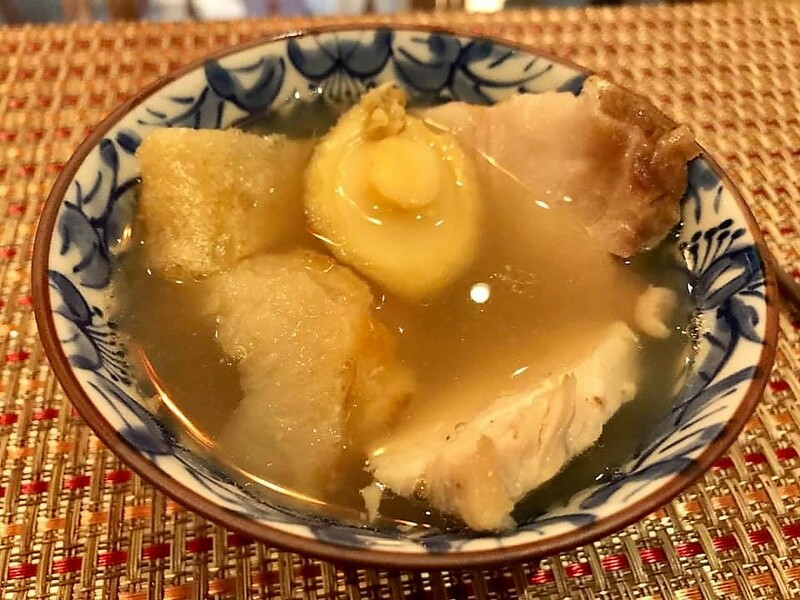 in a sense pencai 盆菜 doesn’t need much skill or cooking….so it is just the stock or broth for taste, the assembly for presentation, and texture (so different ingredients need differnt timing). i prefer to use braised pig trotters for my gravy/stock base. 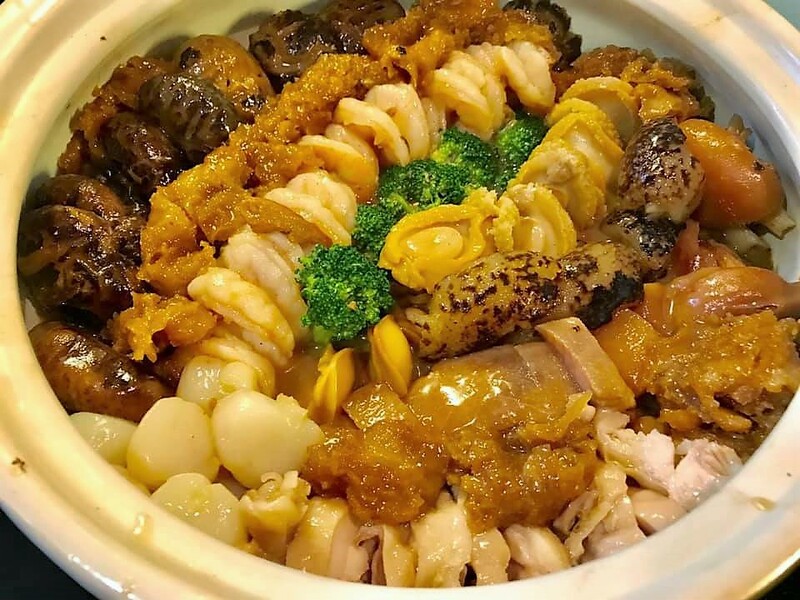 it is my usual teochew braised trotters braise mix and recipe. 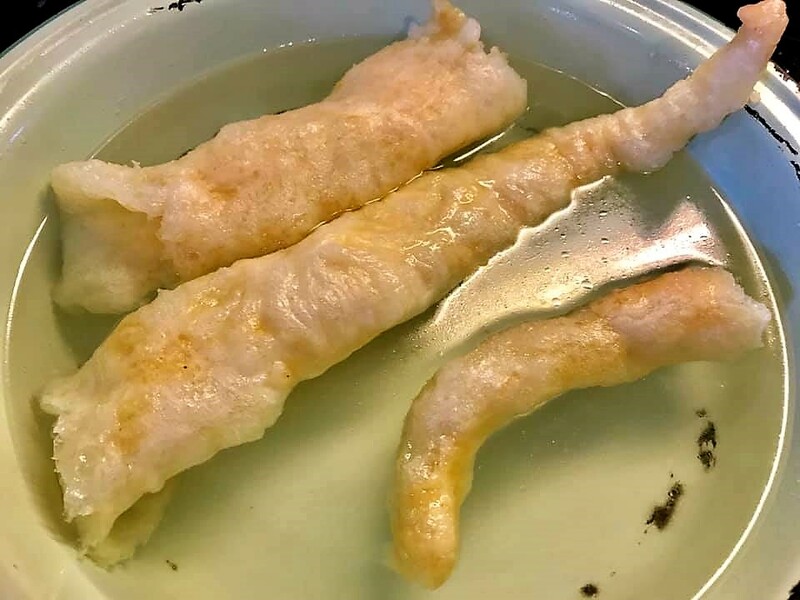 my deepfried fish maw the average type, 2 packets about S$9. use 1/2 packet enough. sea cucumber very expensive, especially now CNY. 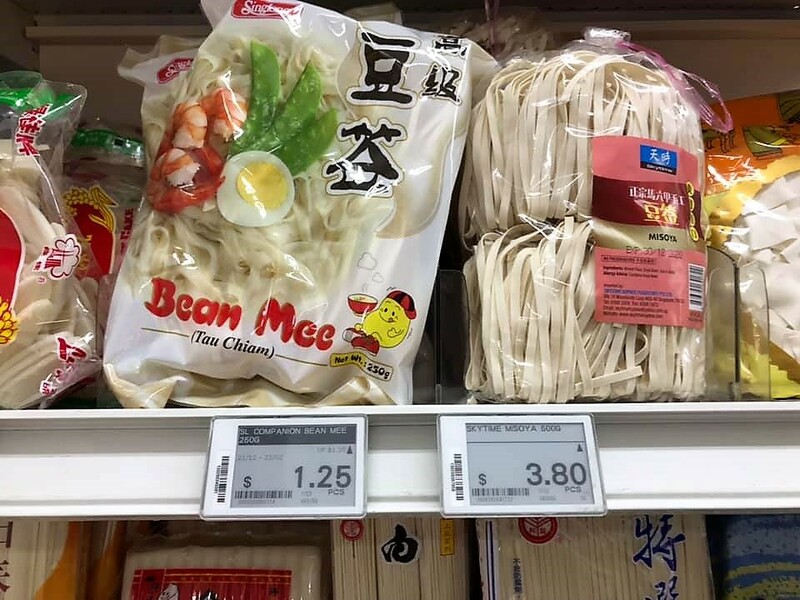 bought the cheaper ones from sheng shiong still S$36/kg. i got 2 pieces like S$9. next time i will buy frozen ones <1/2price. these will disintegrate and disappear if i cook too long so i decided just to just poach in the boiled gravy. turned out perfectly. i bought dry flower mushrroms from teh ghim moh shop, 300g no stalks for S$12. good enough! 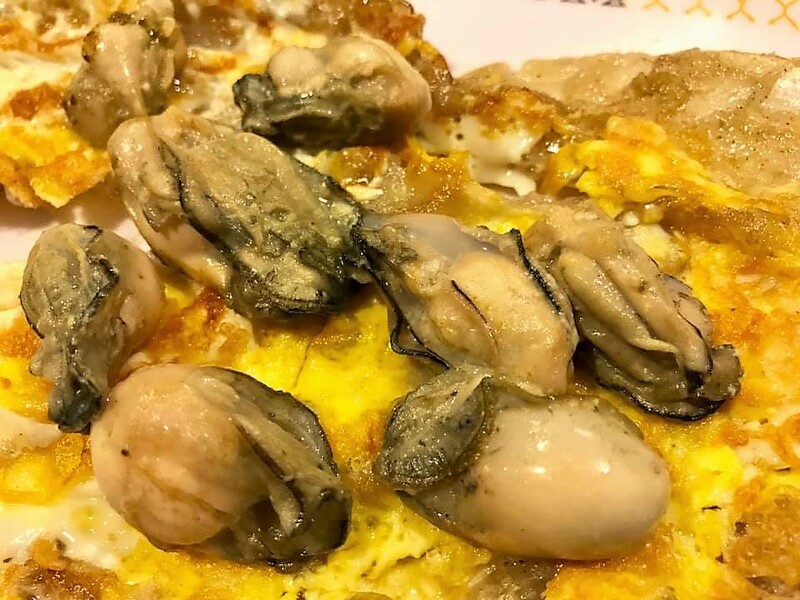 and tiger king 10 small braised abalones, really tiny abalones, but the braise was good. i added the braise to my own trotter braise. 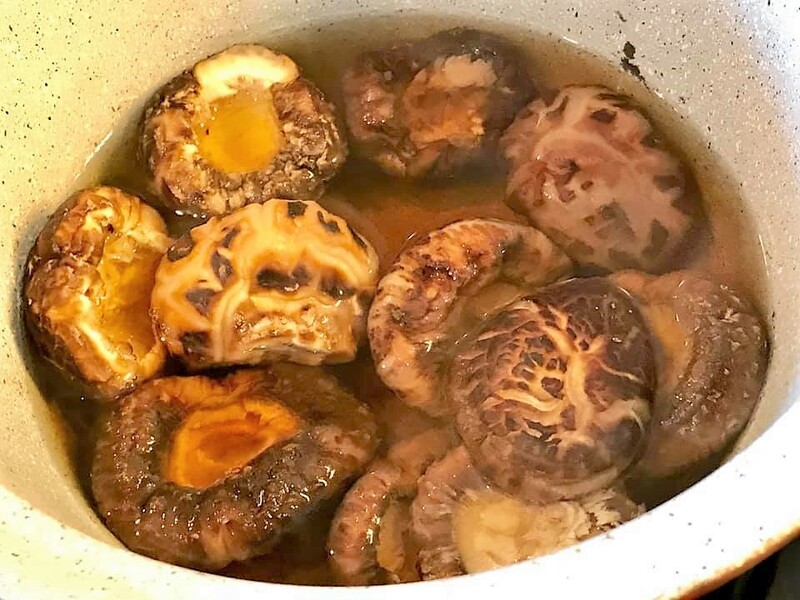 not too difficult, just need good (very tasty) braise which i have from my braised trotters (if don’t like trotters then just use the tiger king abalones braise), and plan the ingredients so cook them to the right texture and timing, then assemble. 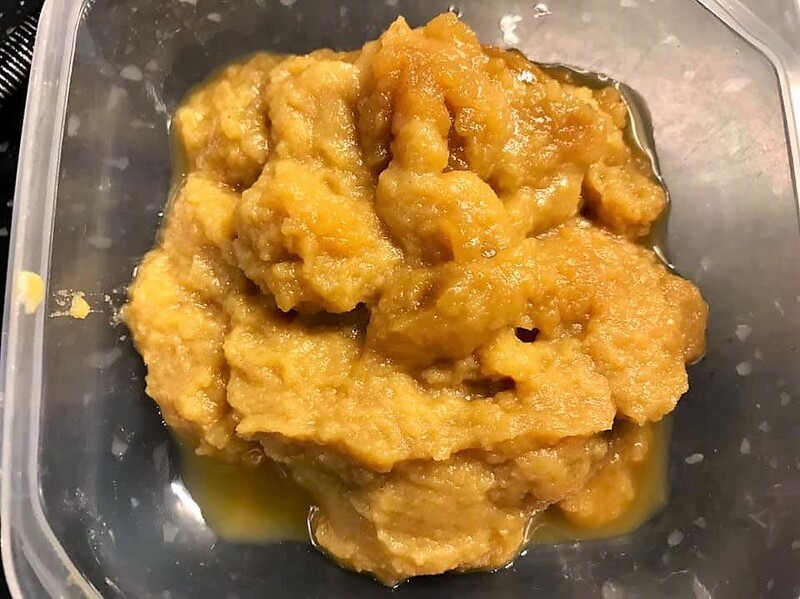 I used pig trotters as a base stock because it gives a natural gelatinous gravy..and very tasty! my own braise-it is good! 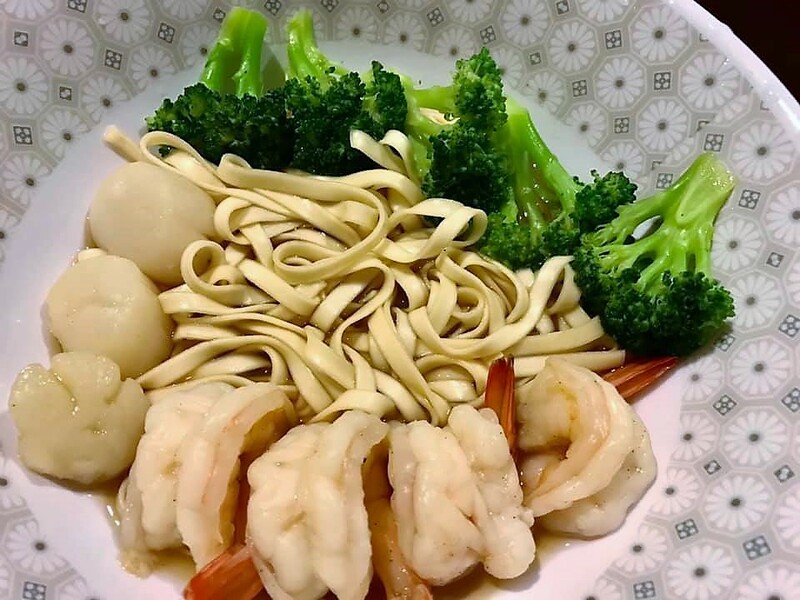 i had frozen prawns,, frozen scallops in the freezer and broccoli in the fridge. so jsut defrost. 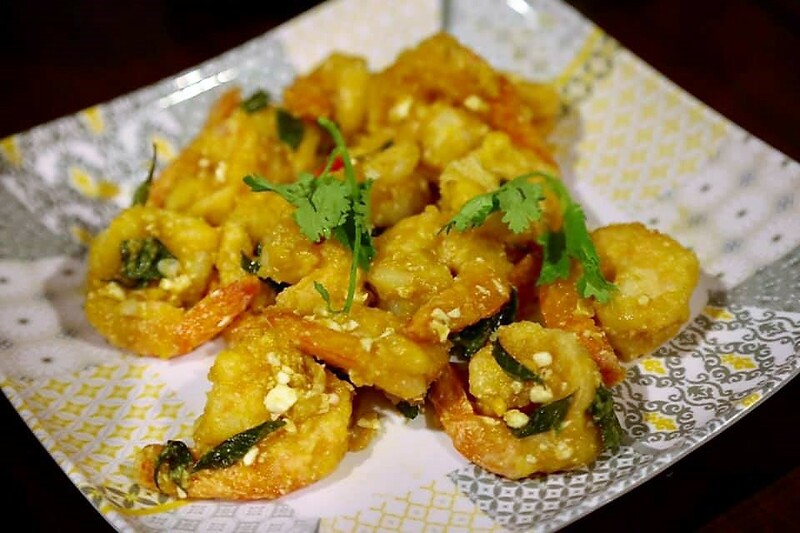 prawns i deveined and seasoned with fish sauce and white pepper. scallops just defrost. just little water 150ml. boil, add 1.5tbsp tsuyu, the jap sauce for soba. 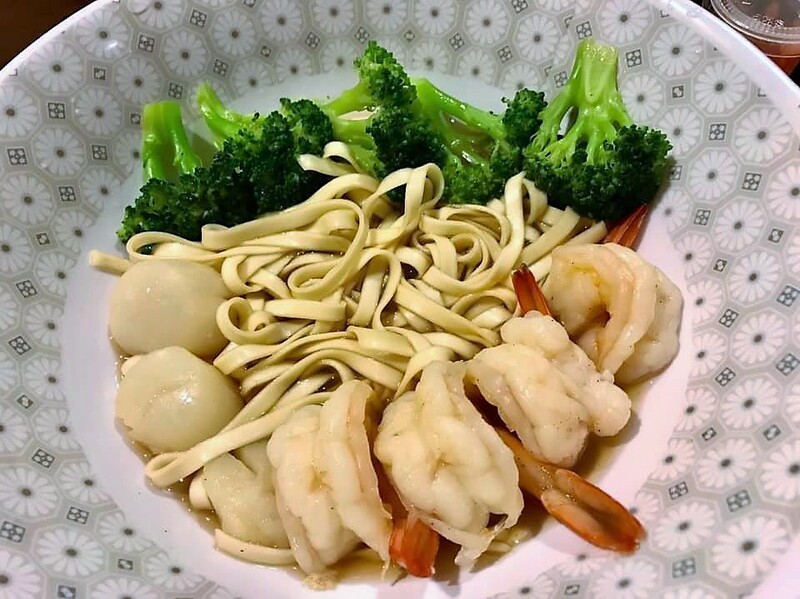 succulent tasty prawns and scallops, luscious broccoli colour and texture, nice tasty broth and perfect texture of bean noodles 豆签. 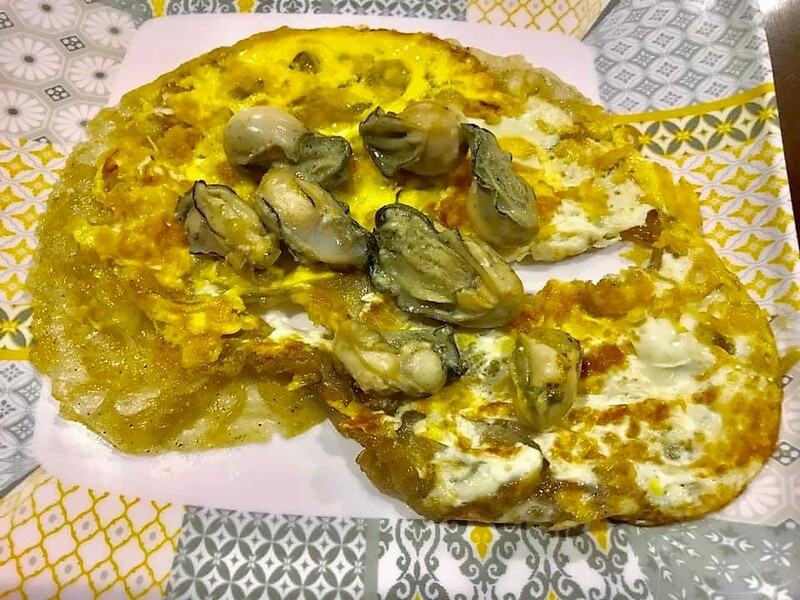 made orh lua for 1pax dinner this evening on 30.1.2019.
for this evening i got it mostly right, and the best i have done so far. 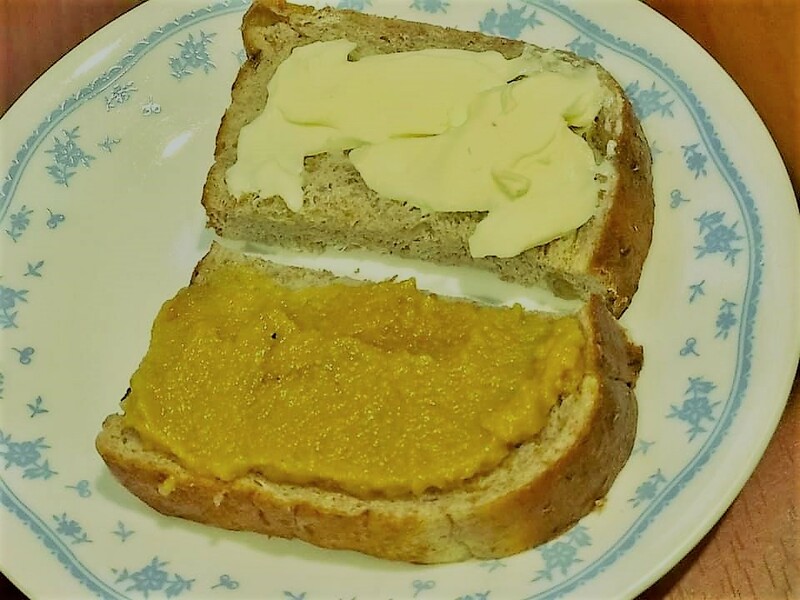 for the preparation, add 2 tbsp water to 2 tbsp sweet potato flour, and add 2tsp fish sauce, and some pepper…mixed thoroughly. 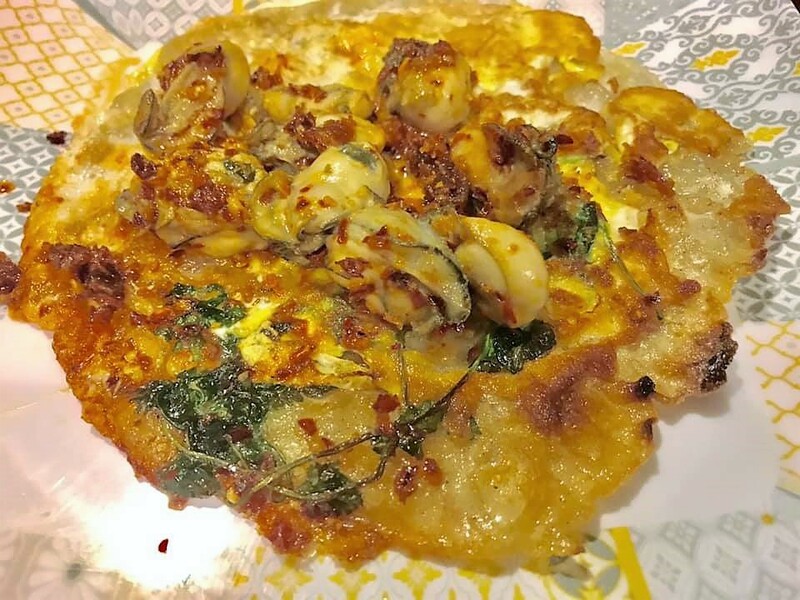 medium high fire non stick pan, let flour batter form & crisp. crack 1 egg on top & roll pan to spread egg. 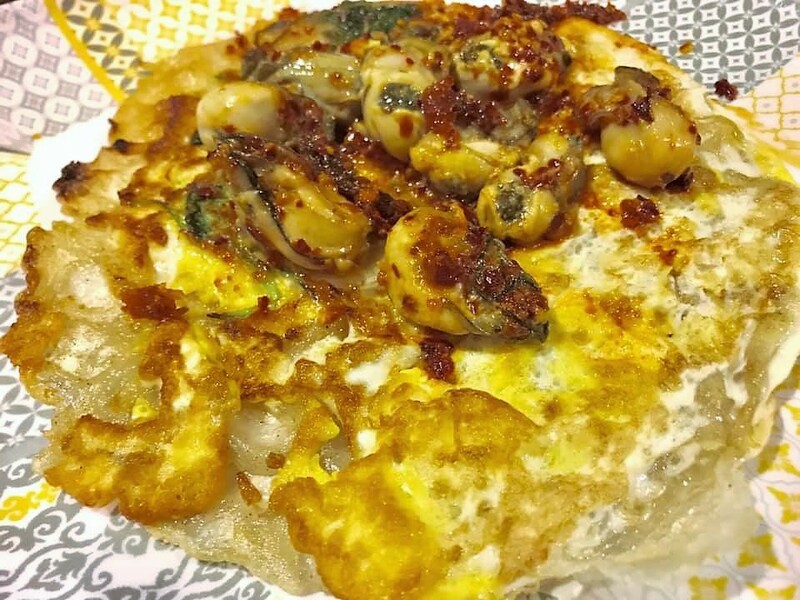 add oyster on the side so it can cook..flip over egg batter. cover & low fire let oyster cook while crisping the other side. add fish sauce. 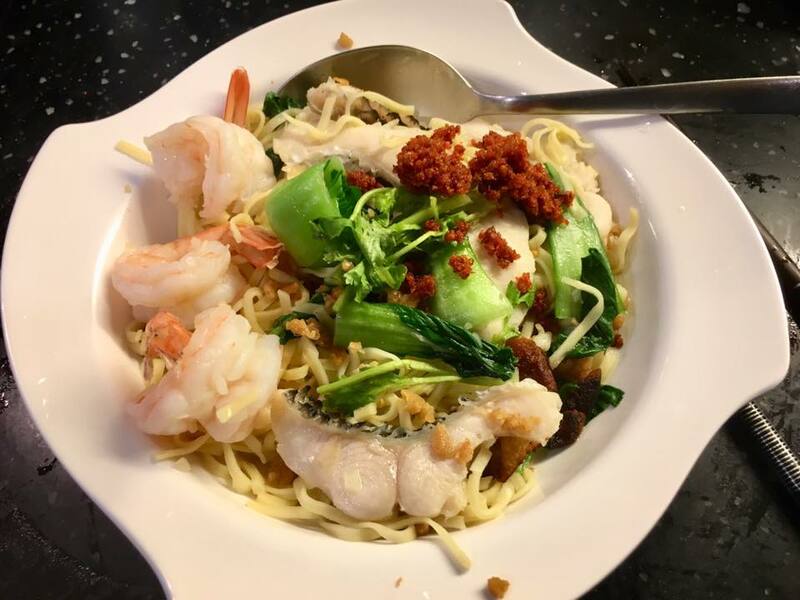 add crispy prawn chilli. 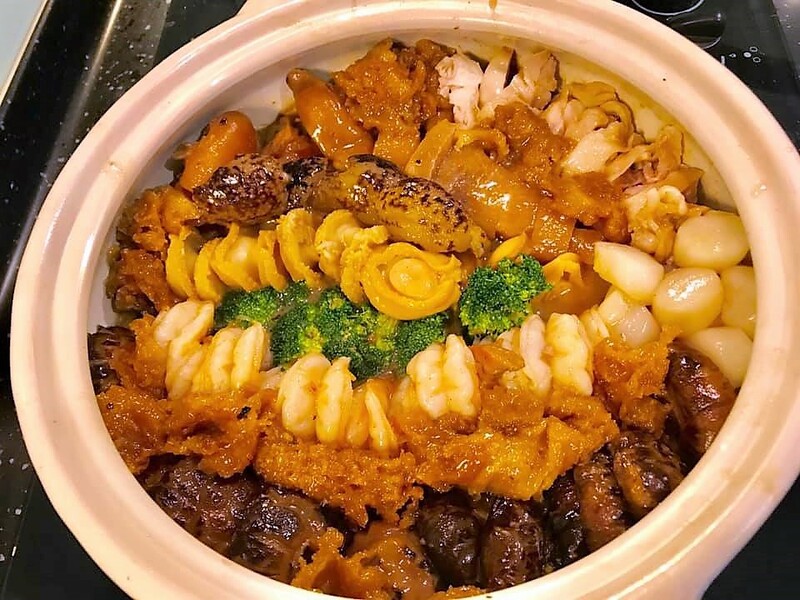 sis & bil came for dinner on 16.1.2019.^^. lazy to plan and do marketing so just cooked whatever i had in the fridge. i had 4 egg whites leftover from making kaya (which requires 4 egg yokes). 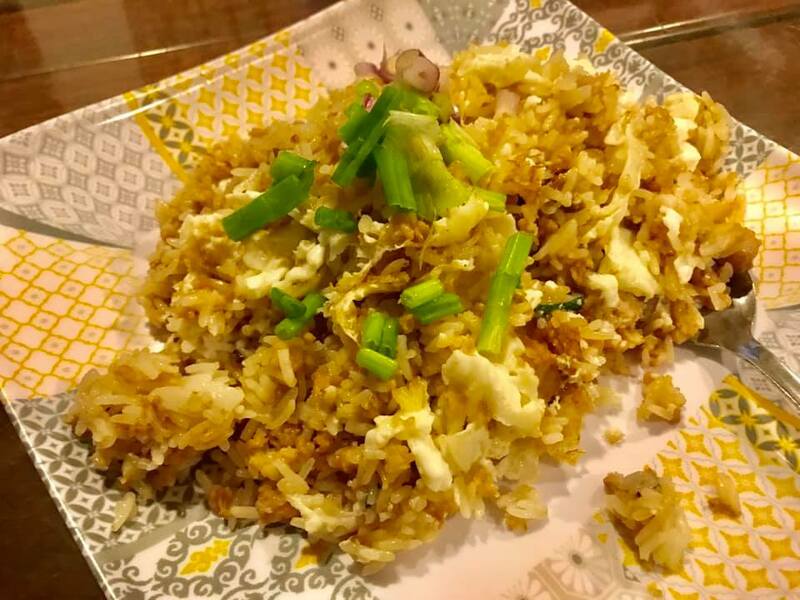 so decided to make salted fish minced pork egg white fried rice. 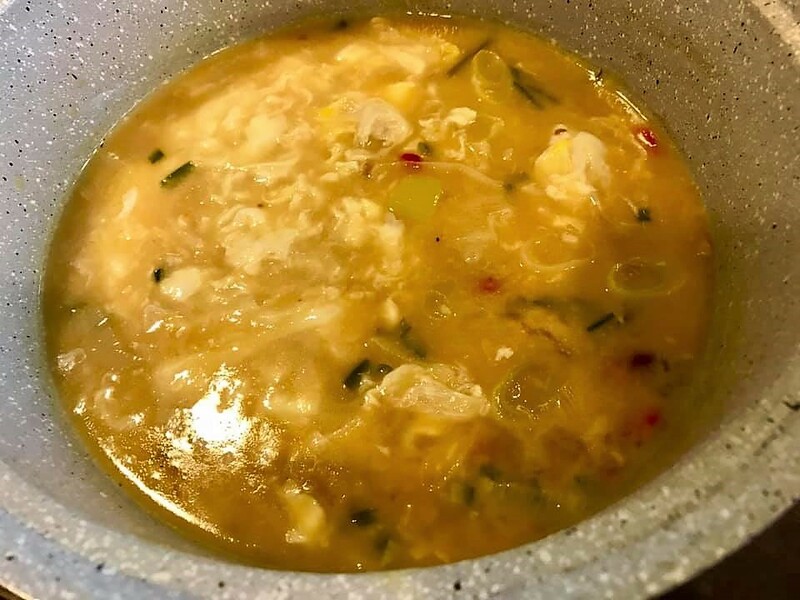 i minced a small slice of salted fish, fried chopped garlic then salted fish lightly, then added about 150g minced pork, mixed in corn flour. 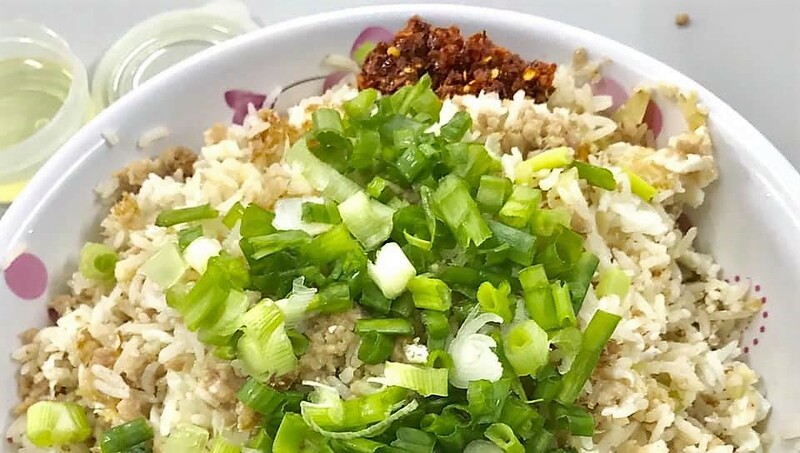 when minced pork ws cooked, i added a cup rice equivalent of cooked rice and mixed thoroughly. then set aside. 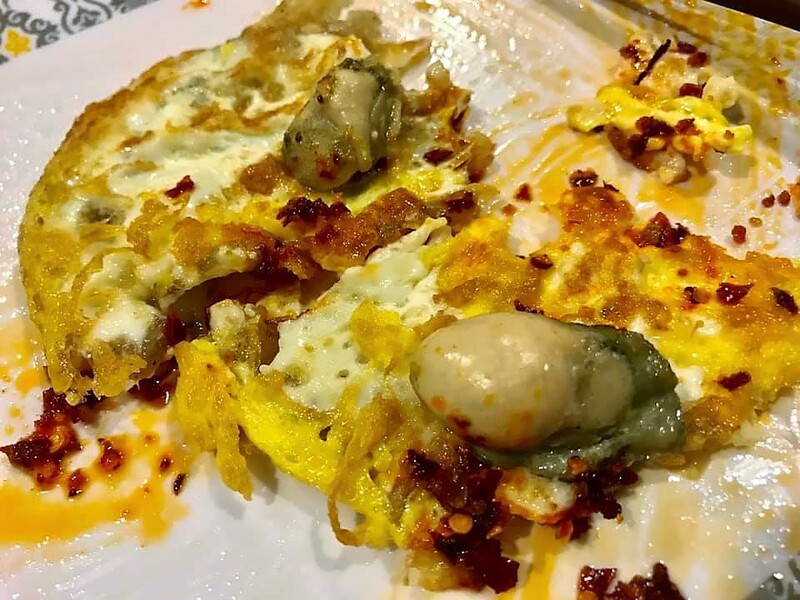 the i added oil and fried the 4 egg white high fire letting them formed a layer and browned, and then added in the rice and mixed the egg white with the rice. 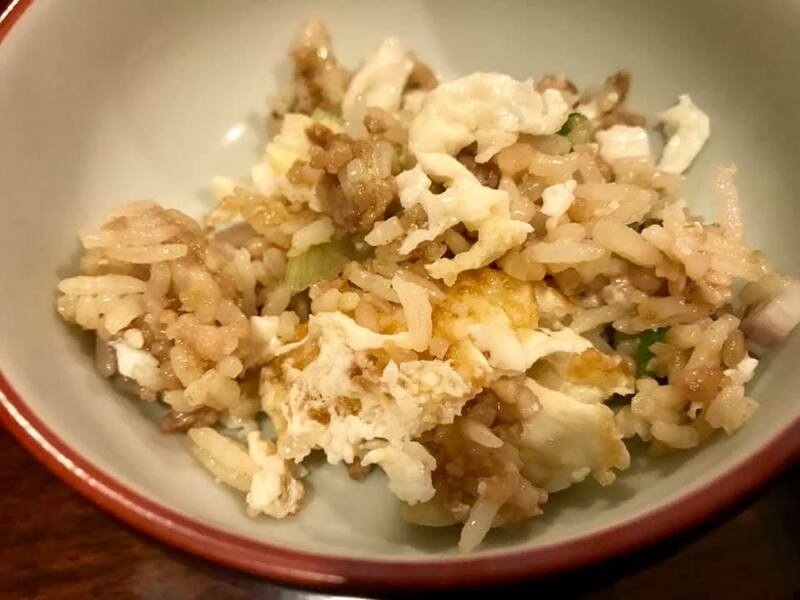 a delectable dish of salted fish minced pork egg white fried rice, excellent wokhae, almost imperial treasure standard la..
add crispy chilli and chopped spring onions to garnish. 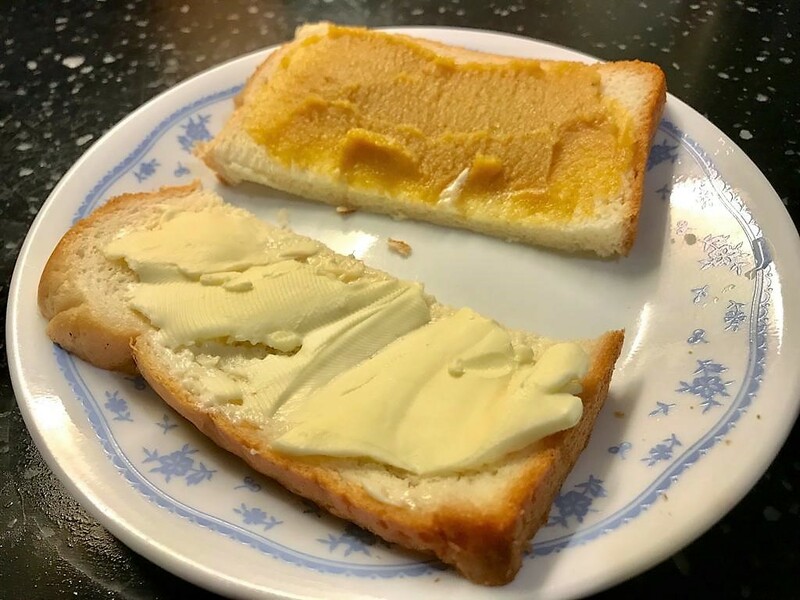 out of the blue, decided to make kaya = coconut jam again. 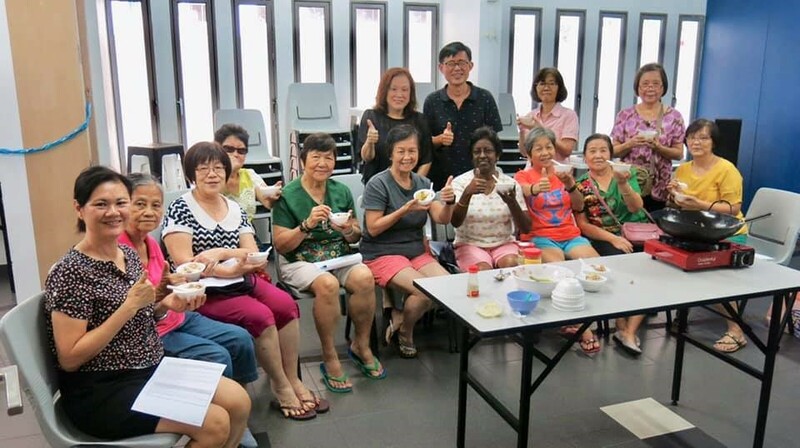 last time i made was on 28.9.2016.
boil the coconut milk, white sugar, palm sugar and pandan leaves, stirring constantly. off fire and continue stirring till all sugar melted. one important step is to pour 1/2 the liquids into the 4 egg yokes, stirring all the time. then add back to the liquids, low fire, stir for 5-10mins until the kaya thickens. and so very easy to make, probably took no more than 15-20mins in all. 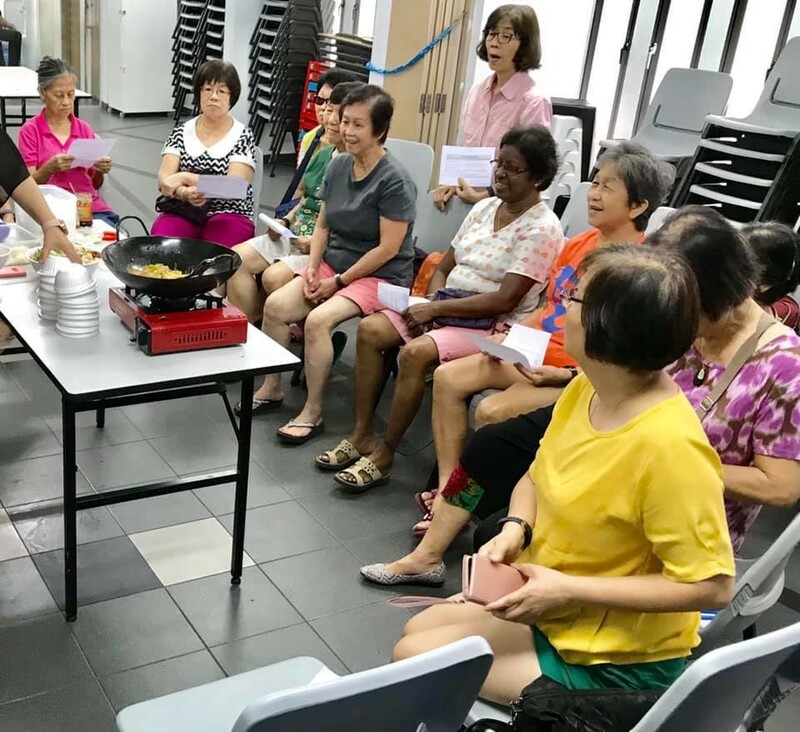 teban gardens PPHCSC (pasir panjang hill community service centre) organised a cooking sharing session on 9.1.2019. ^^. 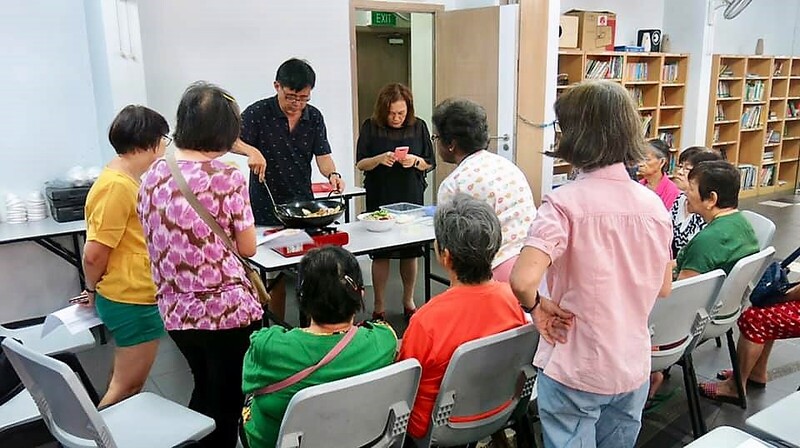 i cooked a breakfast dish for teban gardens every friday unless i am travelling or otherwise unavailable. 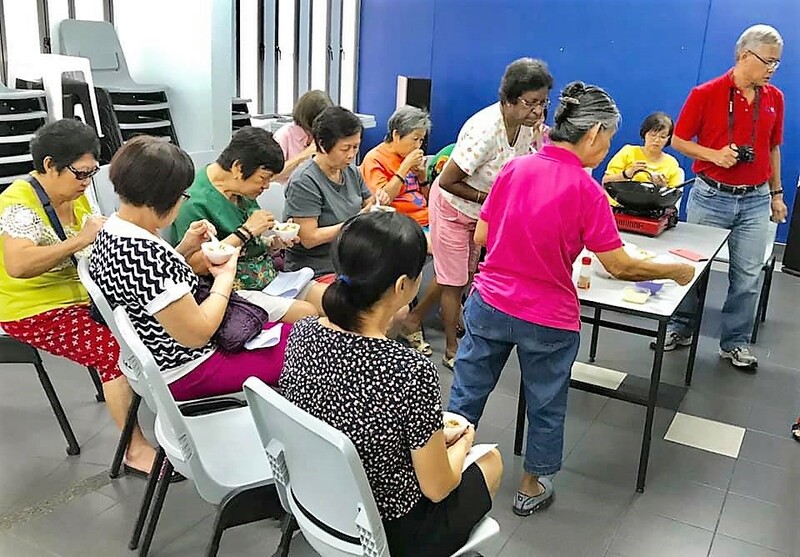 i did my 78th friday breakfast community meal dish at teban gardens community service centre on 28.12.2018. 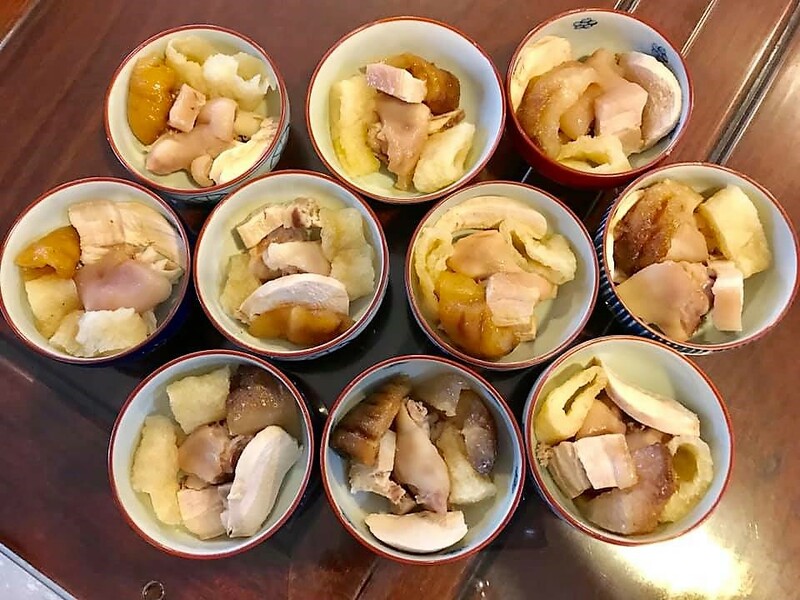 腊味沙煲饭 sausage claypot rice and 黄焖鸡 chinese wine chicken on 10.10.2018.
as before, i tried to demo dishes which they can do easily at home. also, i planned the dishes such that the cooking could be completed and they could try the food within 1/2hr and not wait too long. 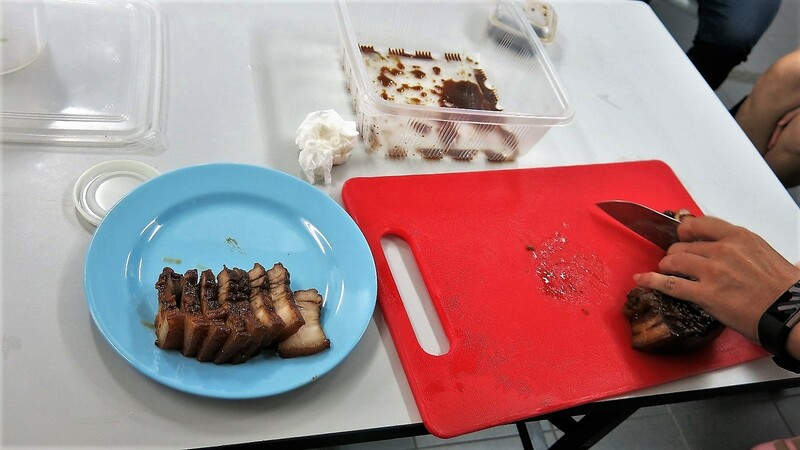 so the dishes were prepared first & heat up or putting on the finishing touches there while i explained the preparation & steps..
first the braised belly pork, recipe at the bottom. 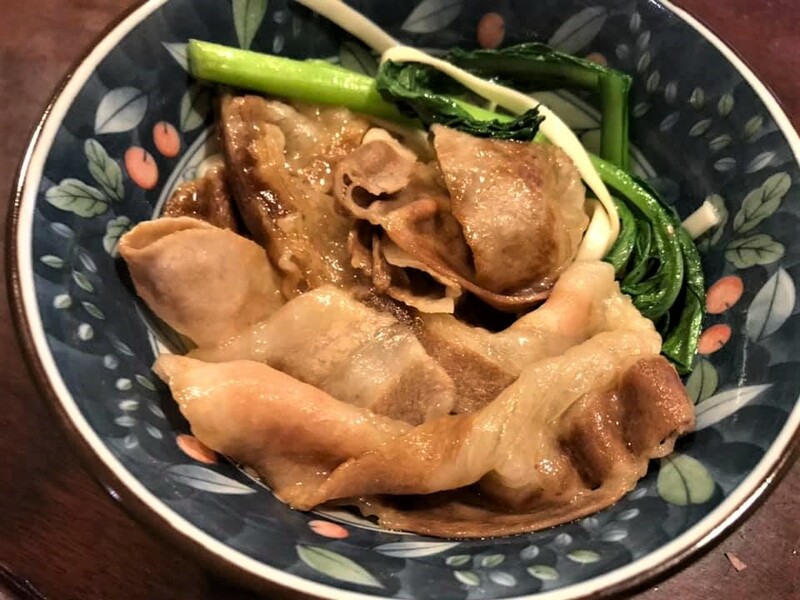 the braise recipe is my own, and i think it reproduces the very good teochew braises i had in hong kong. the technique of braising involved small amounts of thick braise (so do not add too much water for the first 1/2hr of braising) initially to infuse the flavours to the meat, while steaming the meat (coved wokpan) so it is moist and tender. cutting and presentation is the other important consideration. 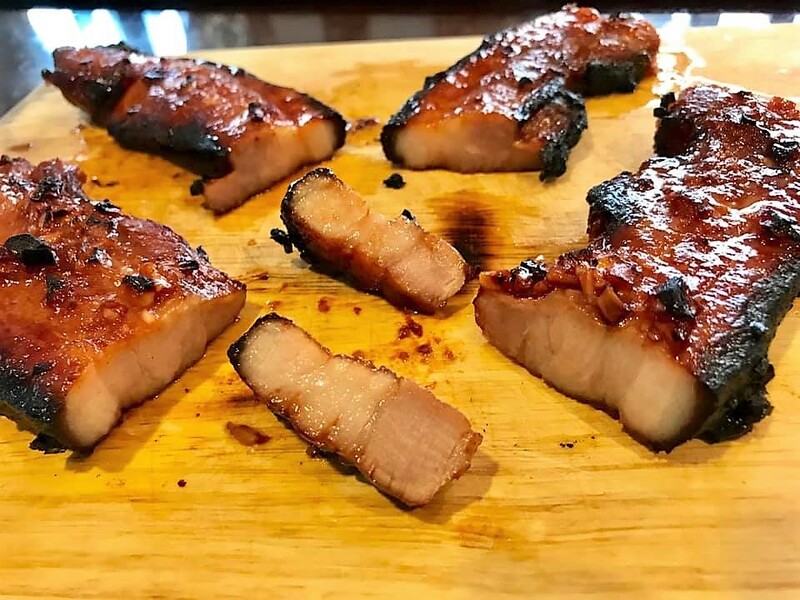 if the braise is to be eaten immediately, texture need not be too soft so 2hrs is about right, and cut the belly pork and serve right away. 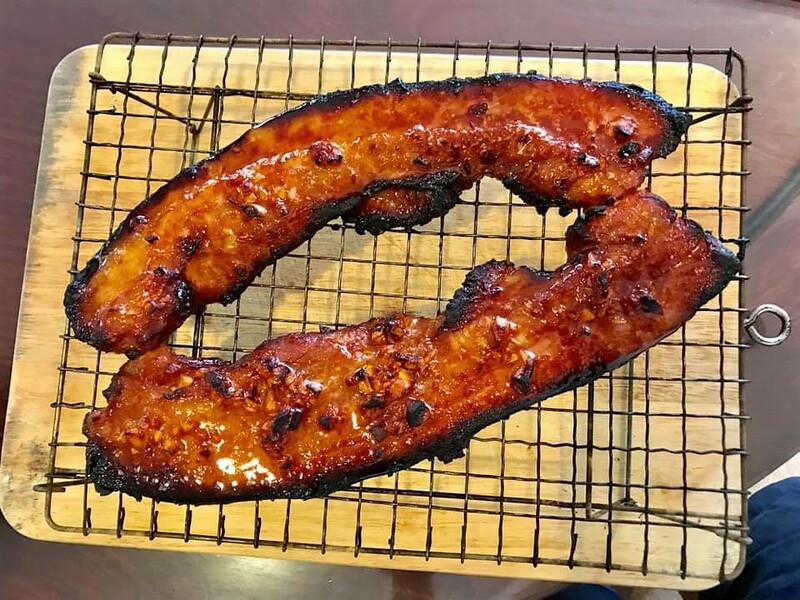 if meat is to be served hrs later or next day, over braise it (between 2hrs and 2.5hrs), and placed in ziploc bag when cook and put in fridge or chiller. then it is easy to cut neatly. can warm up the braise and drizzle over the meat. today the texture and braise flavours were very good, quite perfect. 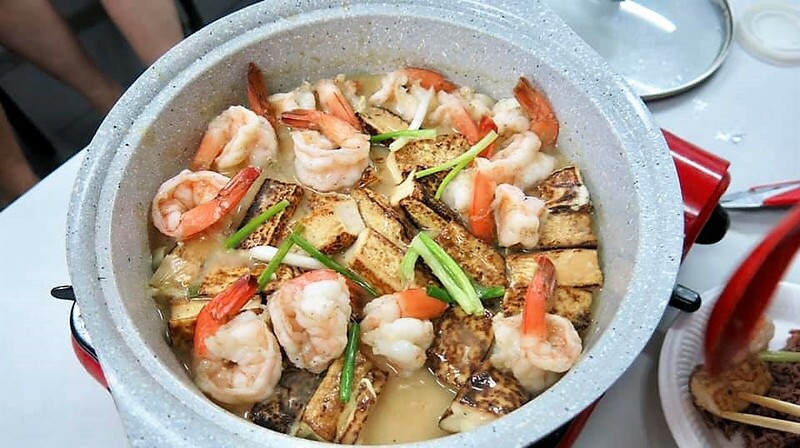 next tofu prawns, recipe at bottom. 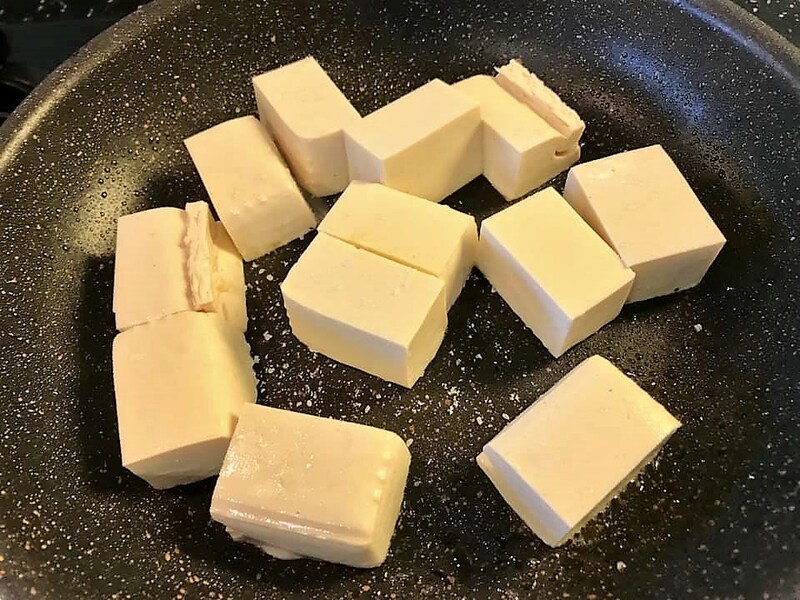 i used vacuum pack tofu, those that indicate they are for frying. for today 17pax i used 2 packs so 600g. 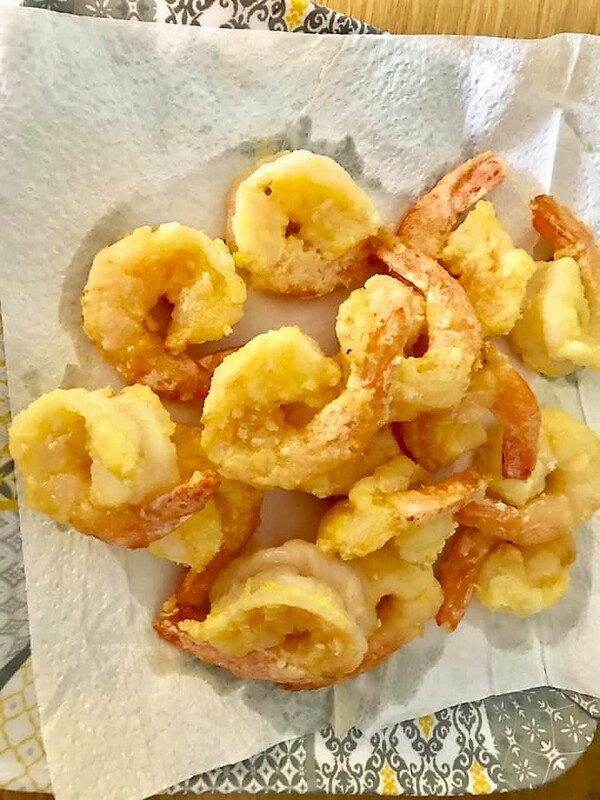 fried them with little oil in non stick pan, and drained oil on kitchen towels. prepared the broth. fried chopped garlic, spring onions and cut chilli padi, added intense chicken stock, 1 tbsp oyster sauce and reduced. 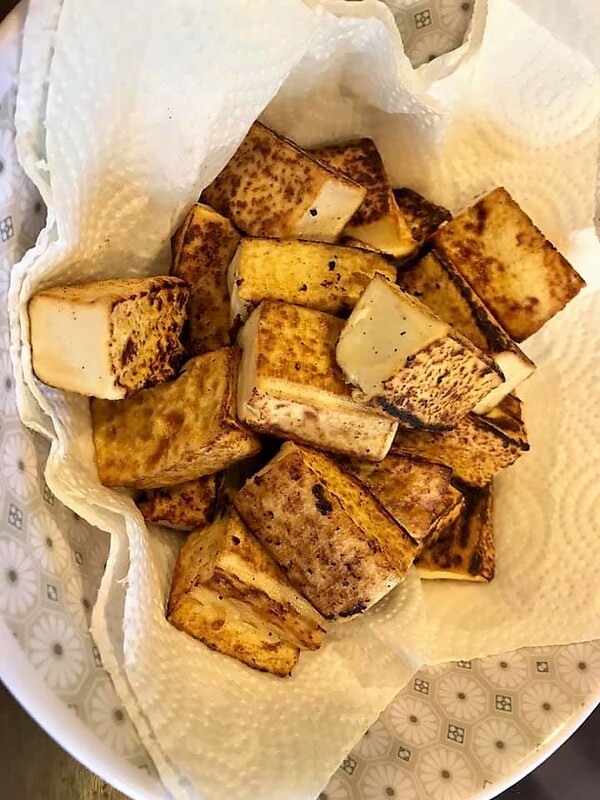 added 1 egg, let it formed then “draw” out a bit..
added the fried tofu to infuse. 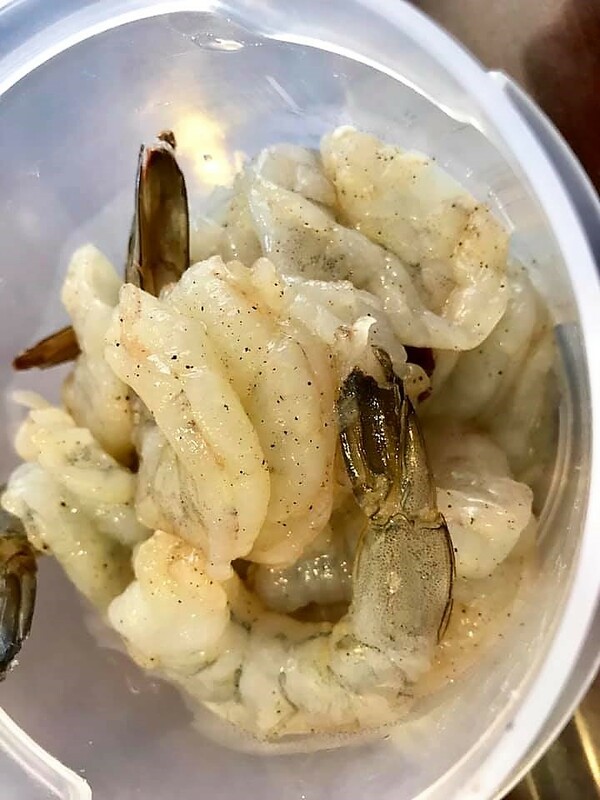 prepared the prawns (15pieces). 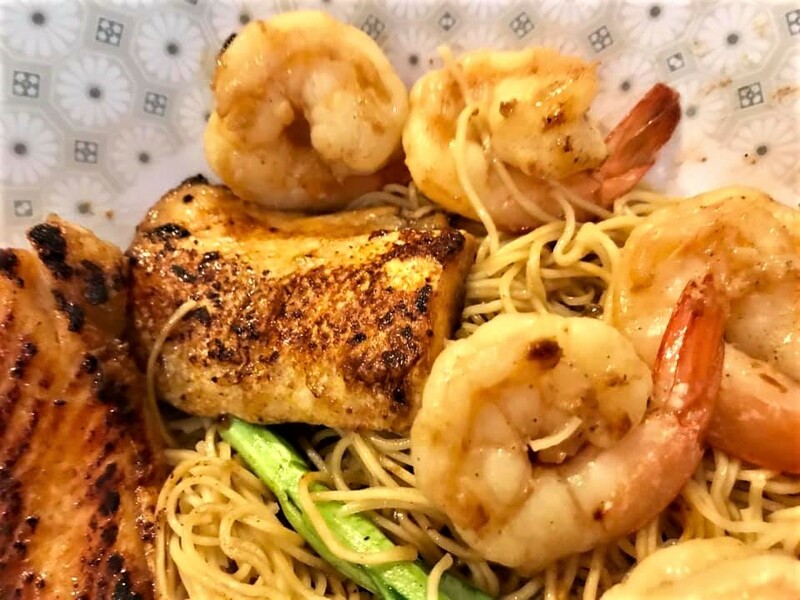 seasoned in fish sauce and white pepper. and the dish was ready for final preparations and serving. so when serving, added the prawns, covered the pot and boiled the stock. 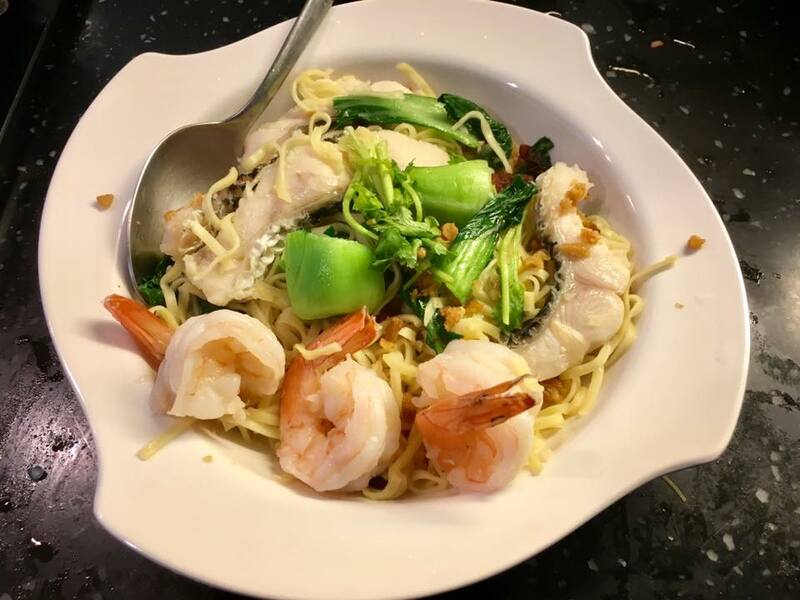 used chopsticks to stir, turn the prawns and immerse in the broth to cook it thoroughly. like anything else prawns need to be fully cook but not overcook. the dish was very tasty and the flavours/aroma was wafting in the room, prawns texture was perfect too. 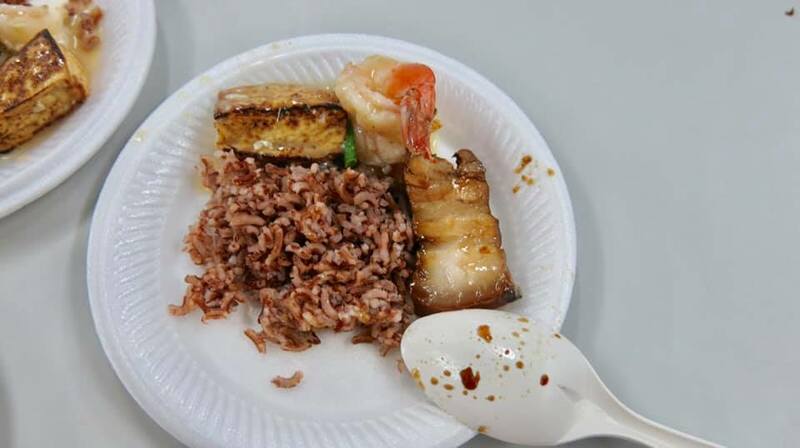 teban gardens prepared some healthy mixed brown rice and everyone was served a portion of the belly pork and tofu prawns with the rice. braise for between 2 and 2.5hrs. 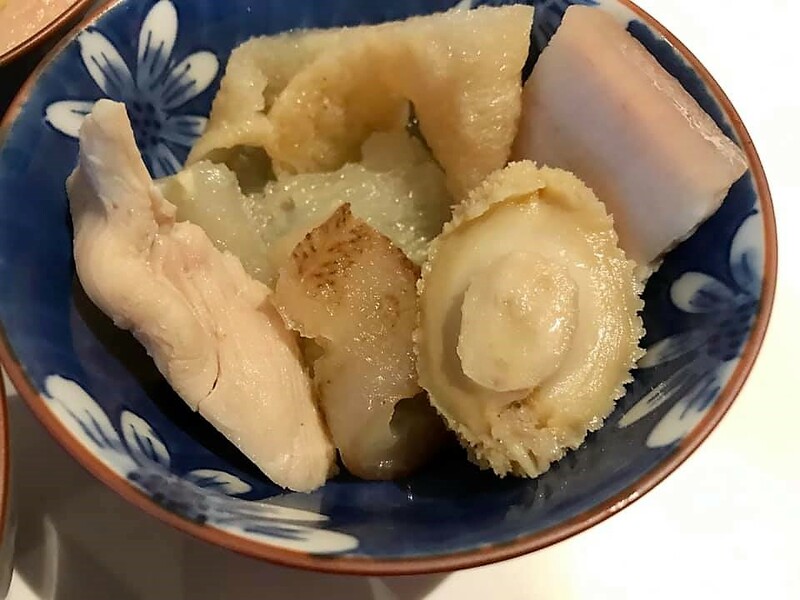 check texture poke with chopsticks, if go through easily, cleanly then pork is ready. 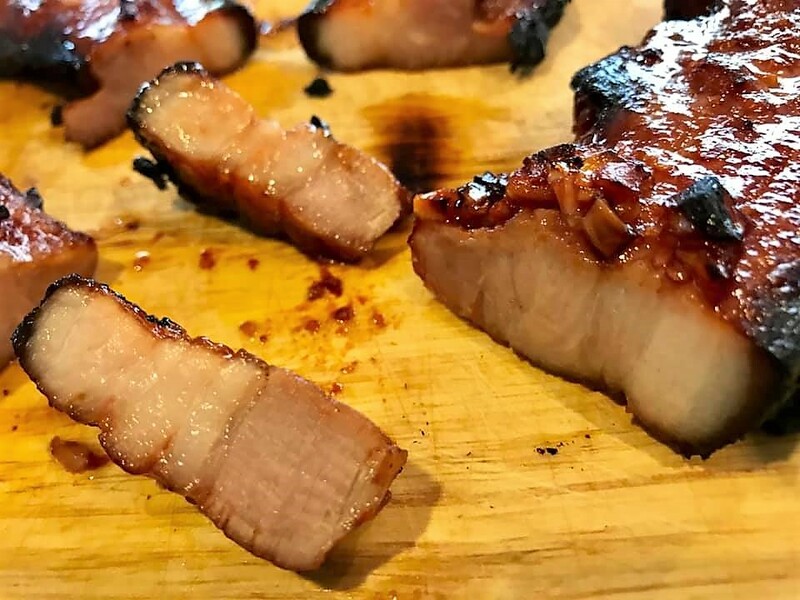 for the 1st 1/2hr add just 1/2 – 1 cup water, topping up & turning the belly pork that is to keep the marinade thick & intense to infuse the flavours. after that add water & let belly pork braise & slowly reduce to a thicker sauce, adding water as required. 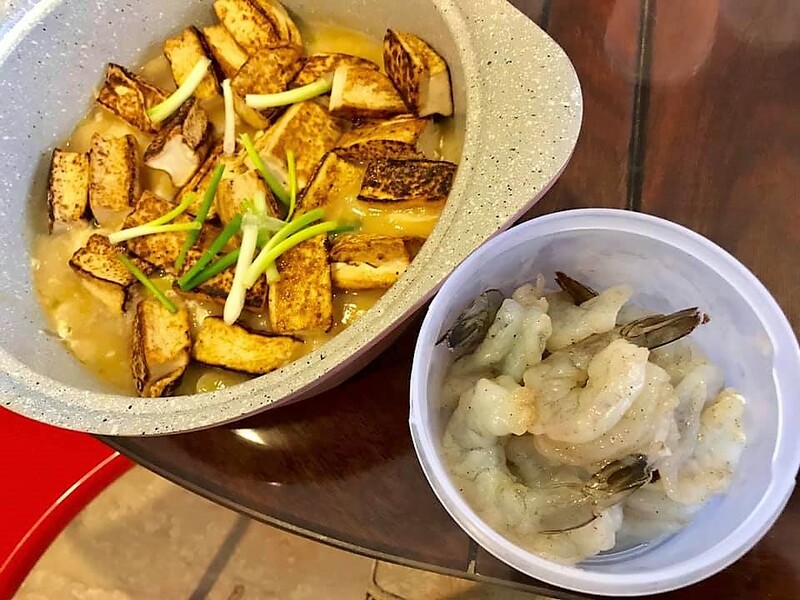 fry with little oil on nonstick pan..add some sea salt..
when serving add tofu, bring to boil & cracked 1 egg let it form then use chopstick to “draw” spread the egg..
add 12 shelled deveined prawns, cover to cook the prawns..
recent days, i did drunken chicken 醉鸡 and saliva chicken 口水鸡 several times. 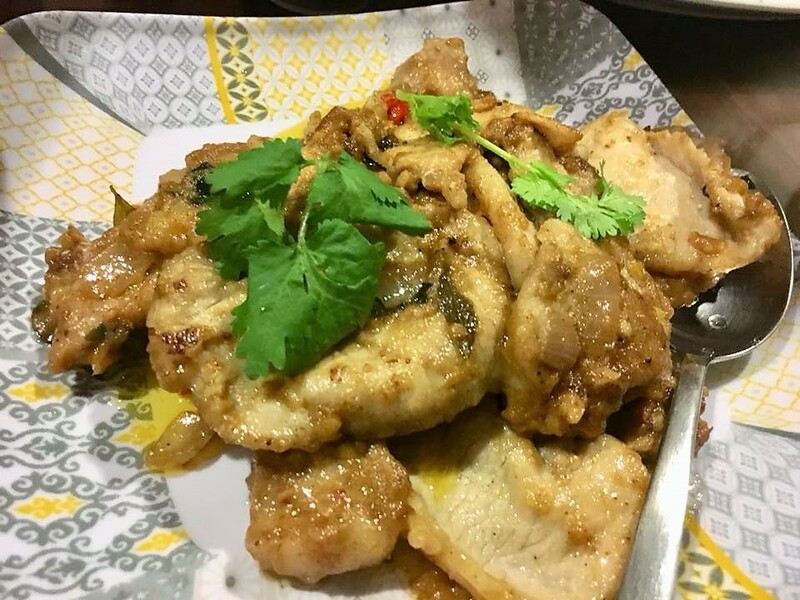 i did both drunken chicken 醉鸡 and saliva chicken 口水鸡. this evening, both dishes were quite excellent. all the friends liked them. wife especially like the drunken chicken. 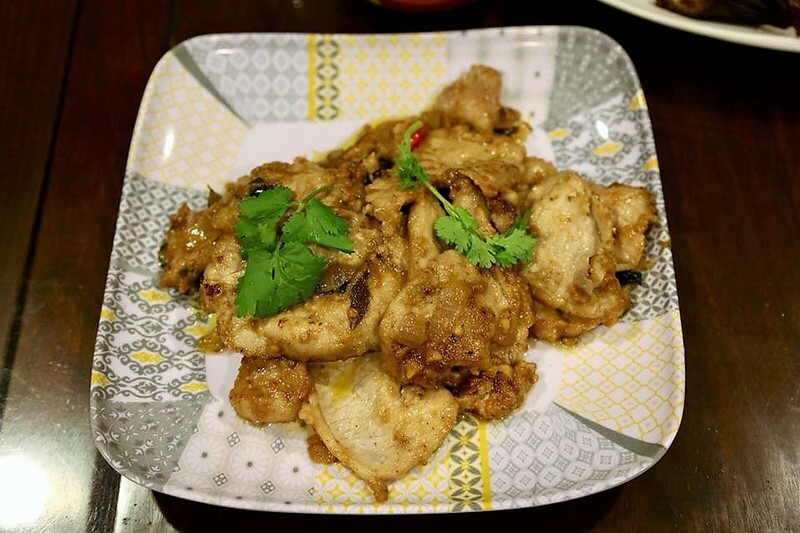 i used the usual 白斩鸡 preparation, but becos kampung chicken is 1-1.1kg c/w large chicken 1.4-1.6kg, i have to adjust the timing = so boiled 9mins & poached 20mis. 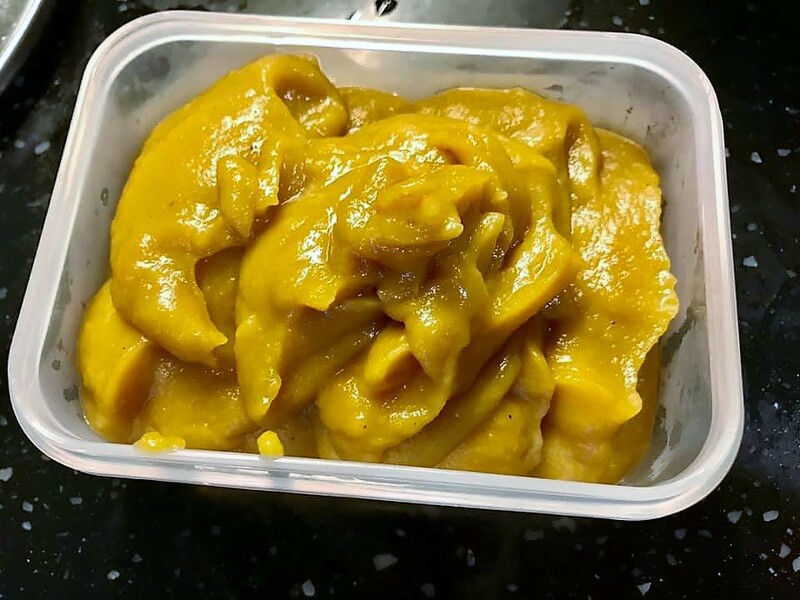 the evening before, i salted the chicken and dry in the fridge and washed thoroughly next morning before boiling in the chicken stock. so the usual ice water treatment to produce the smooth taut skin and chill in fridge, then debone, and place 1/2 chicken in each dish. 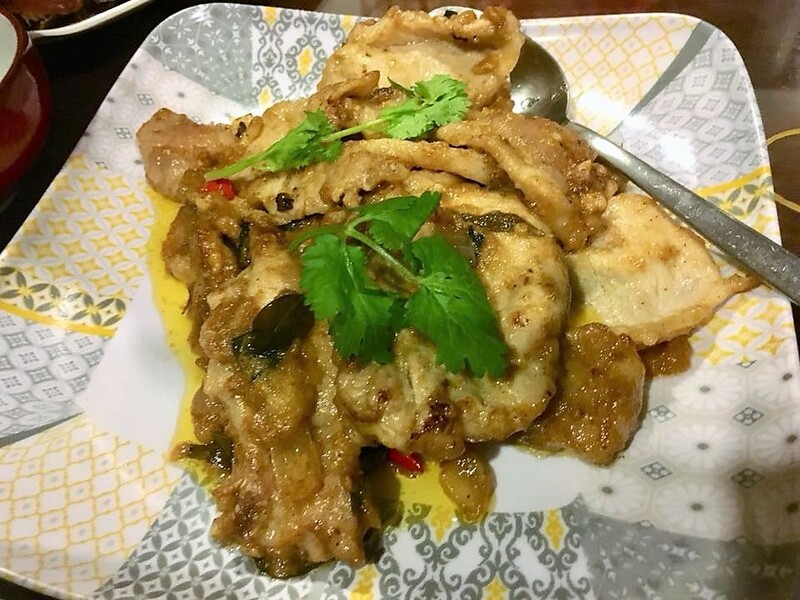 for drunken chicken 醉鸡 i added 1/2cup huatiaojiu, 1/2 cup chicken stock, 2 tbsp fish sauce and 1 tbsp sugar. mixed well then added to the chicken and placed sealed in the chiller. 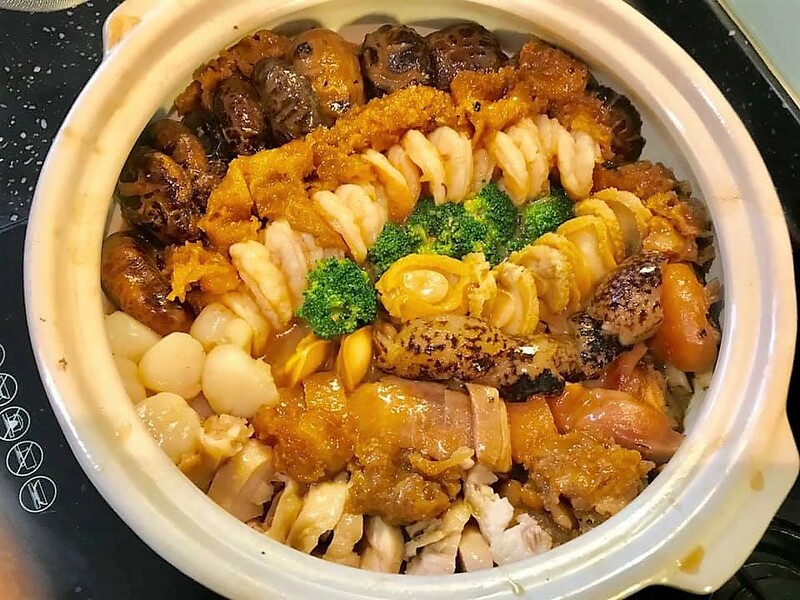 and i did a 6pax dinner for OPS bros and friends on 3.10.2018.
so for the recently 9pax dinner with brother and sister families on 26.11.2018, i again did both drunken chicken 醉鸡 and saliva chicken 口水鸡. 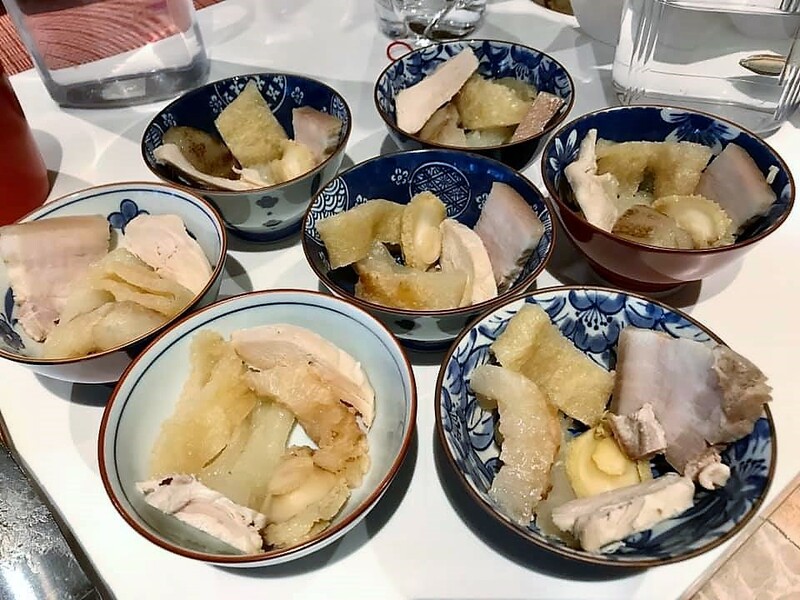 again i used the 白斩鸡poached chicken method. salted chicken overnight. cooked 9mins & poached 20mins in chicken stock (carrots, red onions, spring onions. 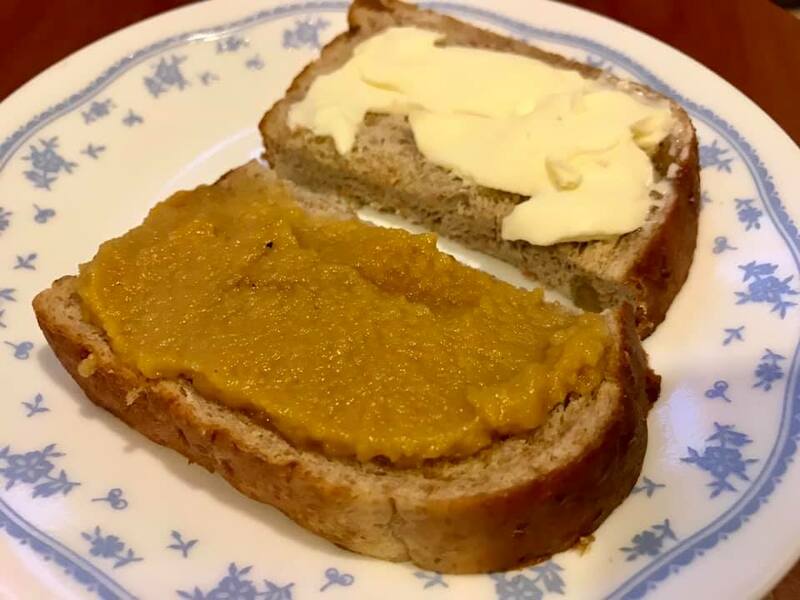 ginger, garlic cloves). immersed in ice water & placed in fridge. then deboned & placed in 2 dishes. 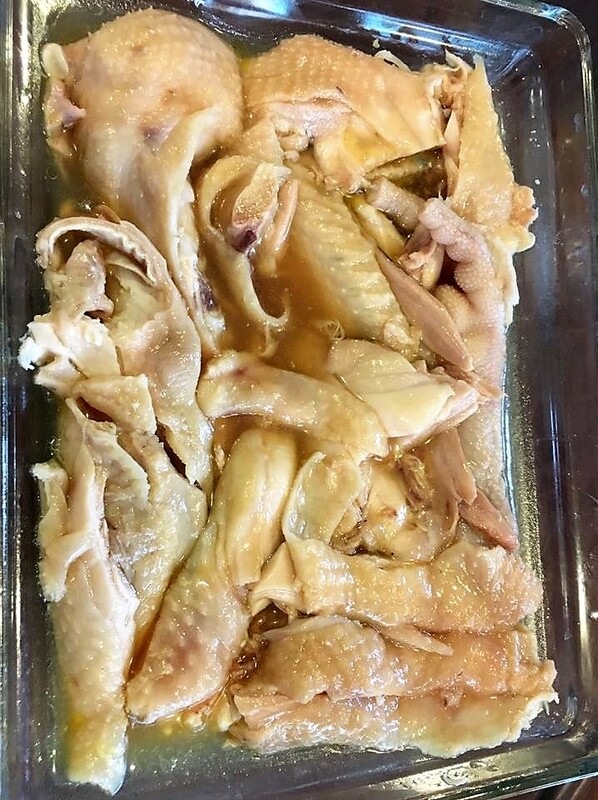 for drunken (醉鸡) chicken, i added 1/2 cup chicken stock, 1/2 cup huatioajiu, 2tbsp fish sauce & 1tbsp sugar. mixed thoroughly then cover, immerse the 1/2 chicken and place in the fridge. 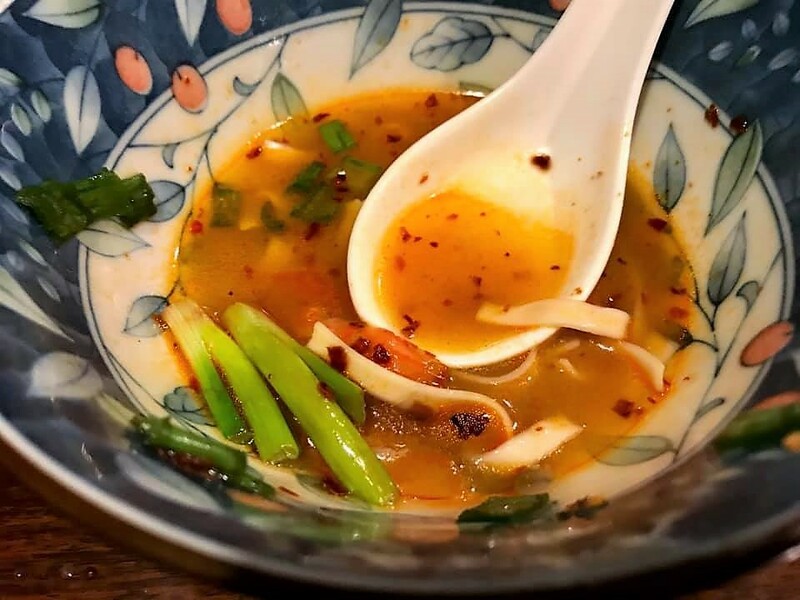 make chicken stock with bones from 1 chicken, carrots, red onions, spring onions. 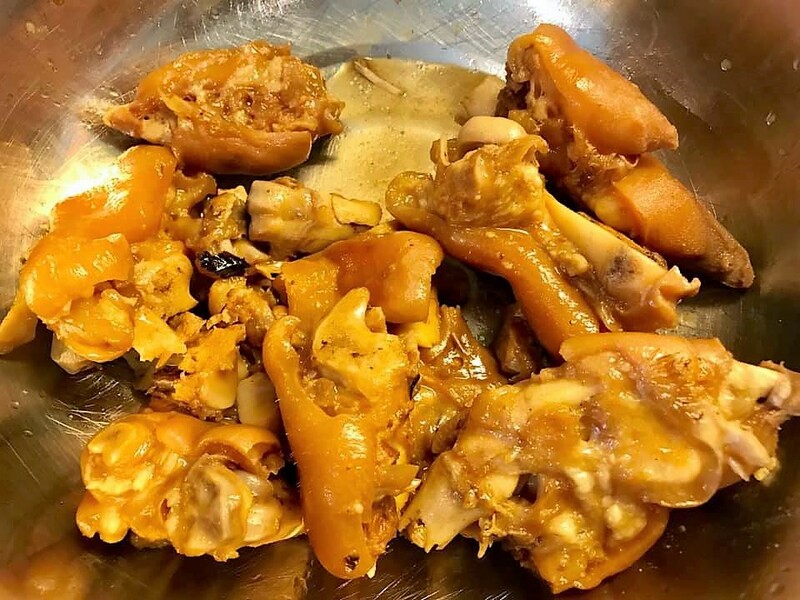 ginger, garlic cloves. salt chicken overnight. cut chicken into 1/2 and washed thoroughly. cook 9mins & poach 20mins in chicken in stock. then immerse in ice water & place in fridge. then debone & place in 2 dishes. 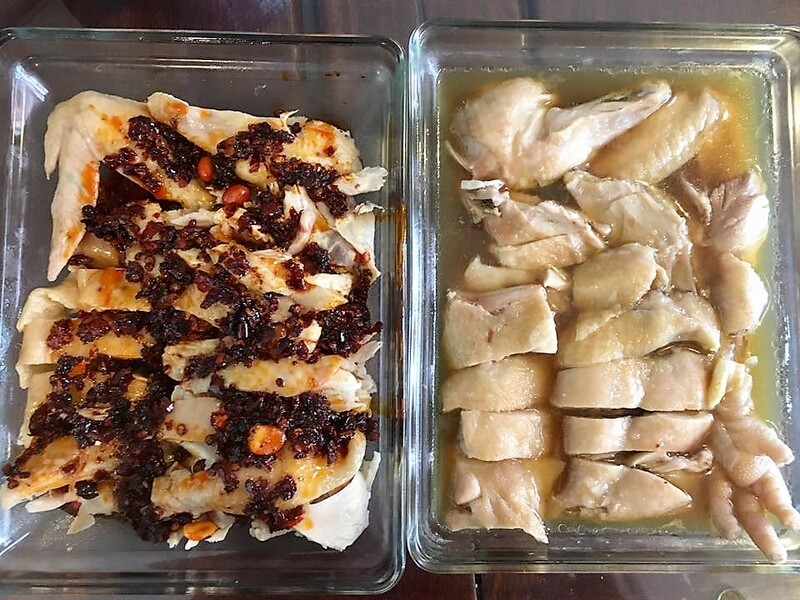 for the drunken (醉鸡) marinade, add 1/2 cup chicken stock, 1/2 cup huatioajiu, 2tbsp fish sauce & 1tbsp sugar. mixed thoroughly then cover, immerse the 1/2 chicken and place in the fridge. 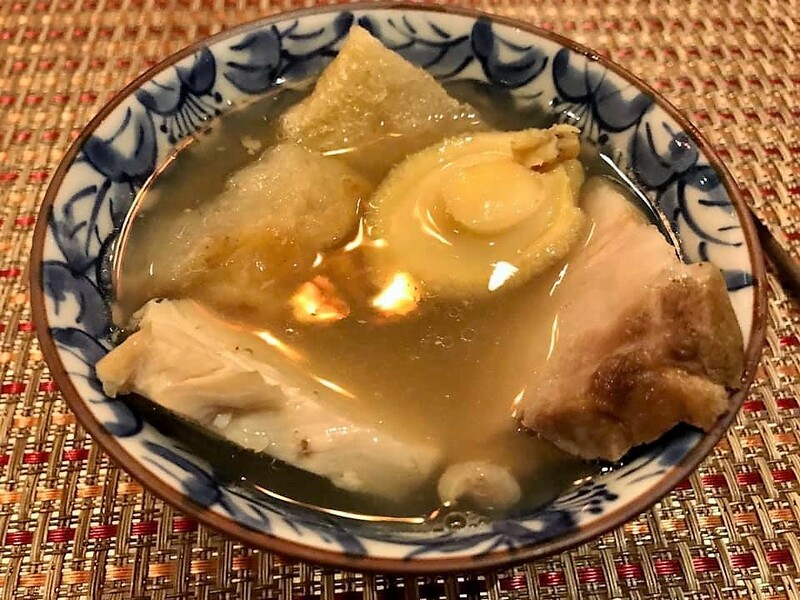 so i had very tasty intense chicken stock, made form chicken bones, carrots & other aromatics like red onions, spring onions, cut ginger and peeled garlic boiled for 4-5hrs and reduced. 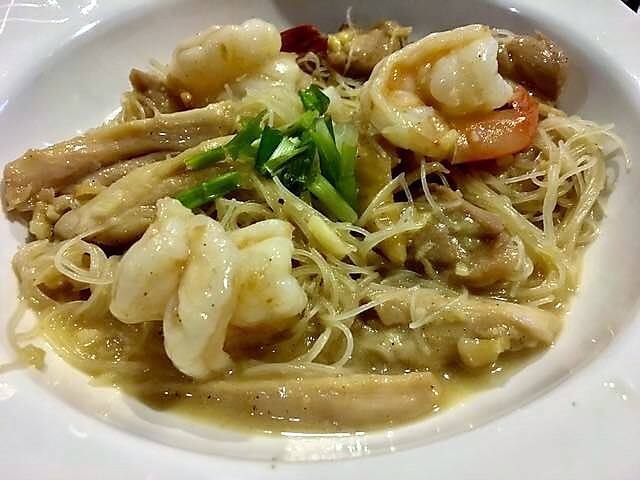 i had sliced chicken and 3 large shelled deveined prawns. basically reduced the stock while cooking the sliced chicken and prawns. 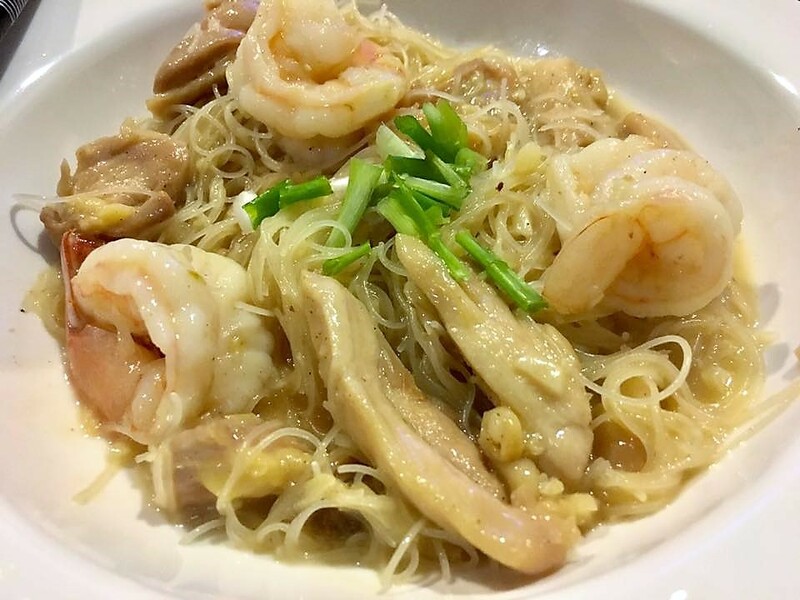 the judgement was with the amount of stock and beehoon so bee hoon was well infused, & along with prawns and sliced chicken NOT overcooked while beehoon and sauce not too wet or dry. for this evening, quite perfect la! friy cut chilli padi & sliced ginger in 1tbsp oil, add chopped garlic. 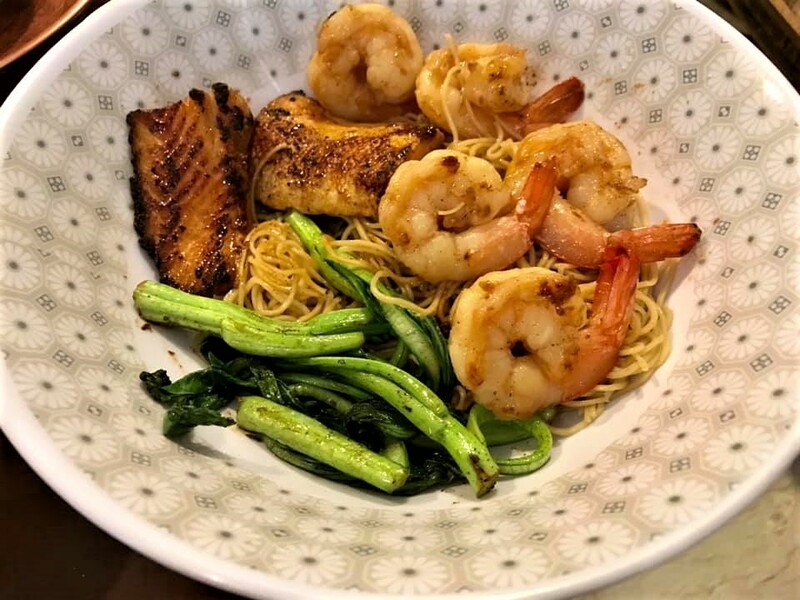 reduce stock while cooking the sliced chicken and prawns. 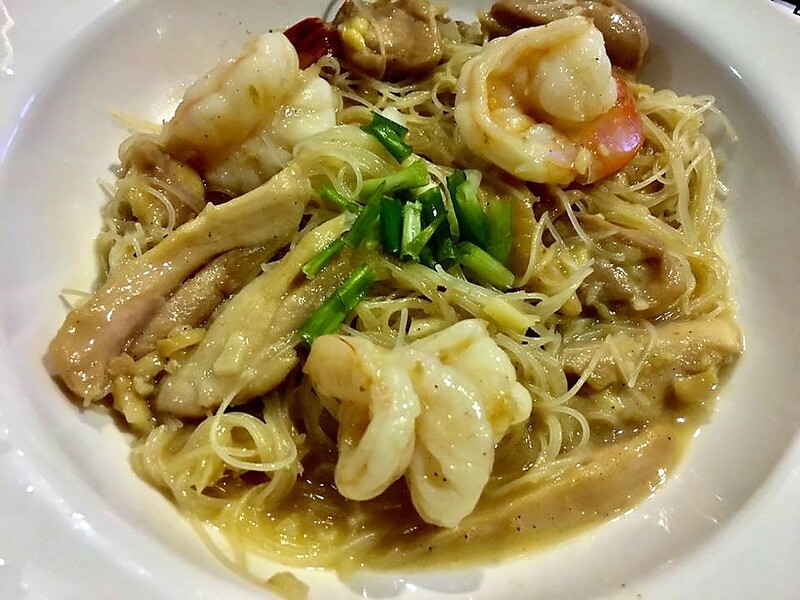 the judgement, agaklogy, is with the amount of stock viz a viz beehoon so bee hoon is well infused, & along with prawns and sliced chicken NOT overcooked while beehoon and sauce not too wet or dry.